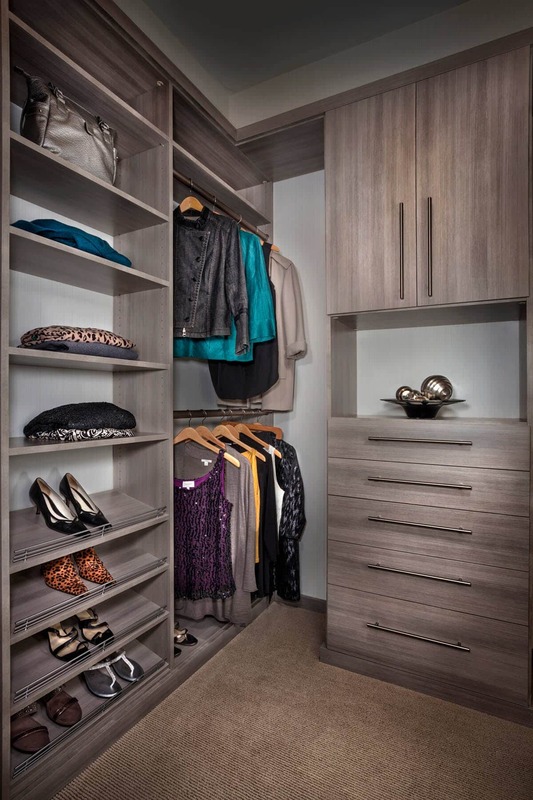 We specialize in designing custom closets for people like you who want a more organized life. 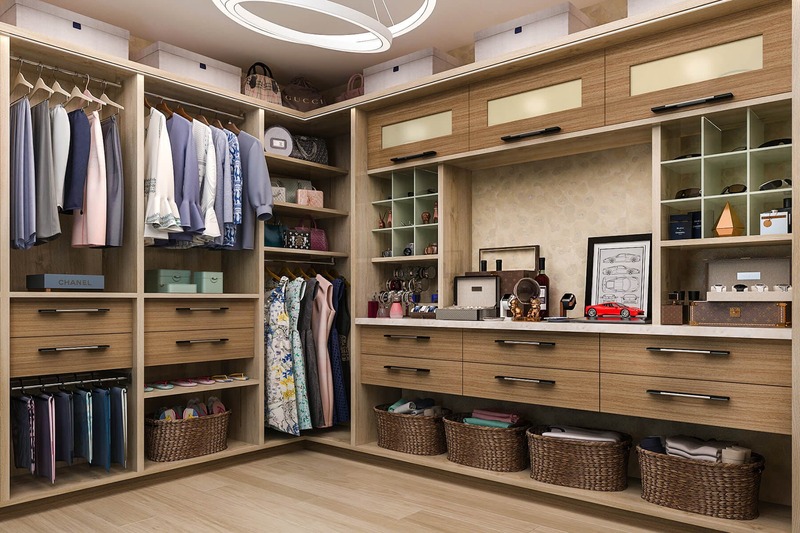 Our closet designers collaborate with you to make sure your organizational system for your closets is customized to your exact needs, design style, and budget. 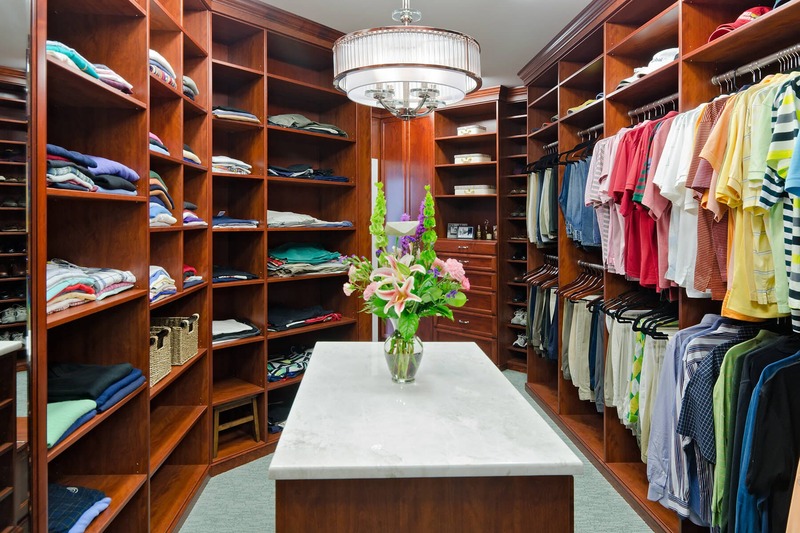 We specialize in designing custom closets for people like you who want a more organized life. 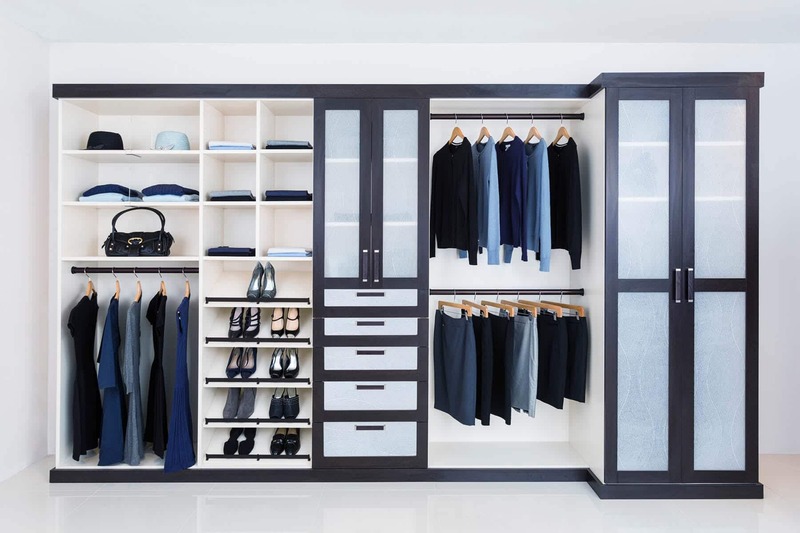 Our closet designers collaborate with you to make sure your wardrobe organizational system is customized to your exact needs, design style and budget. 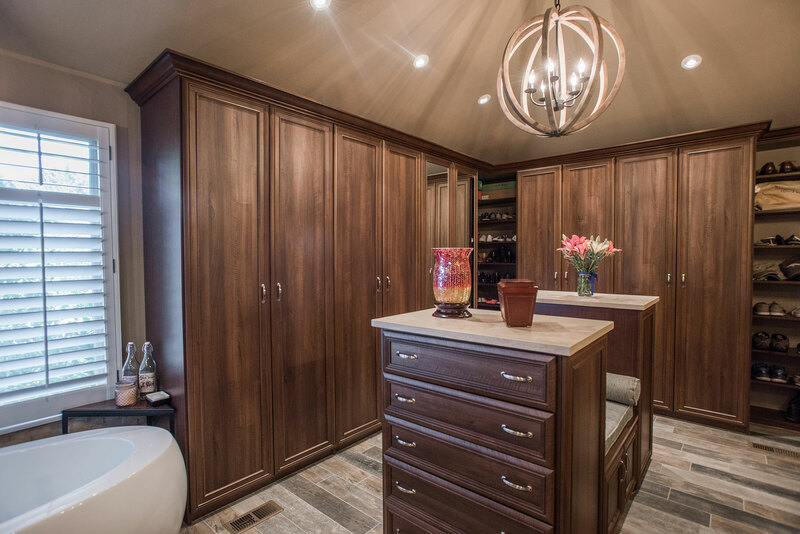 Every project we design is a one-of-a-kind space based on your exact needs, style, and budget. 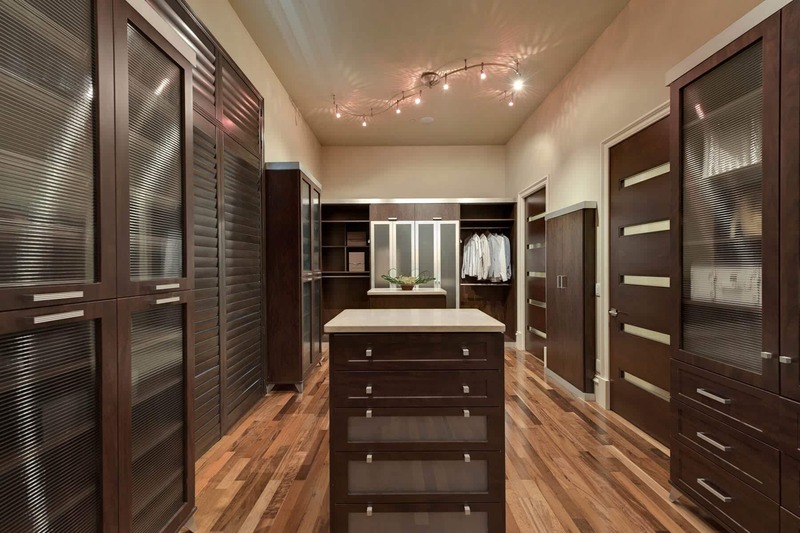 At your one-on-one consultation you will discuss your needs, style preferences, and budgetary requirements. 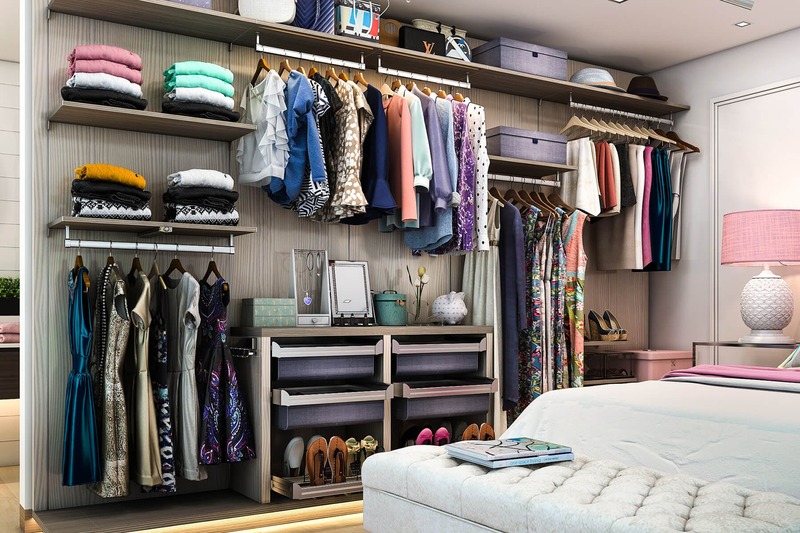 Our daily routine begins and ends in our closets, so we believe your closet should be a place of peace, organization, and beauty. 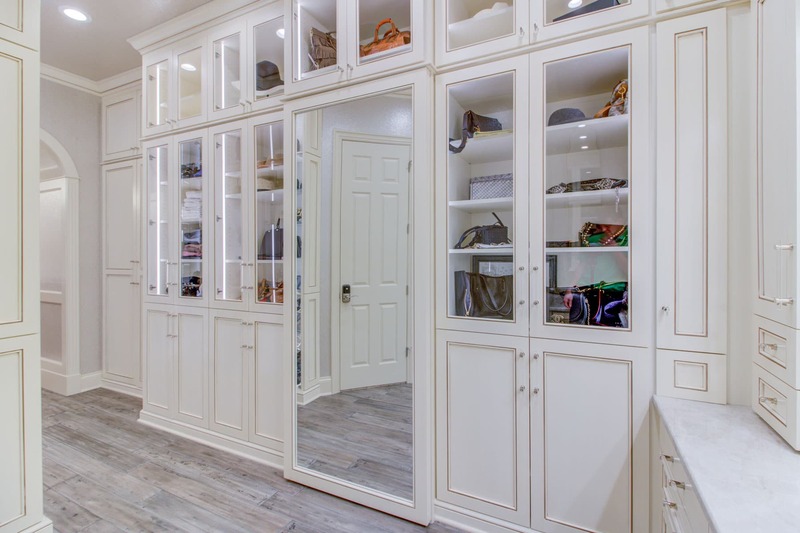 When it comes to the custom design of one of the most personal rooms in your home, our goal is to transform your walk-in, reach-in, or luxury dressing room into an organized storage oasis. 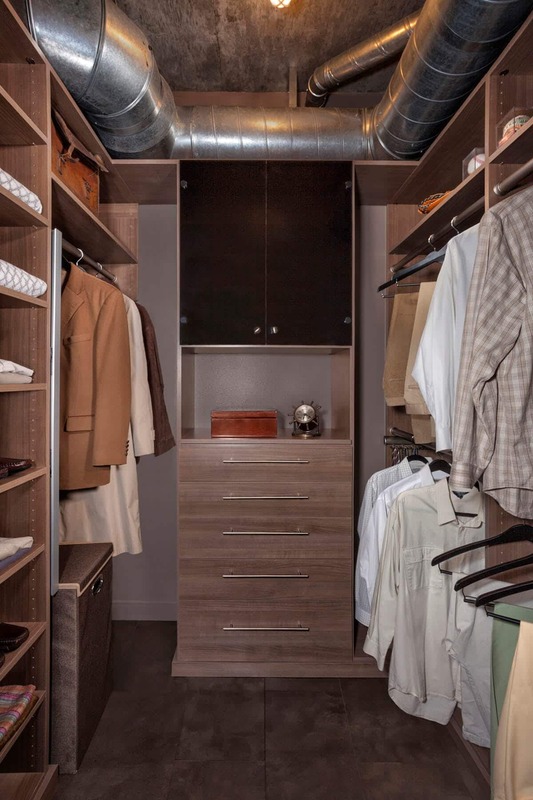 There are many benefits to be gained with a custom closet design, one that includes rods, shelves, built-in drawers and cabinets, that allow you to easily find what you need, take charge of your morning routine, and discover a feeling of harmony to carry you throughout your day. 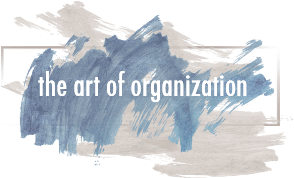 Our approach turns organization into art and your closets into a retreat. 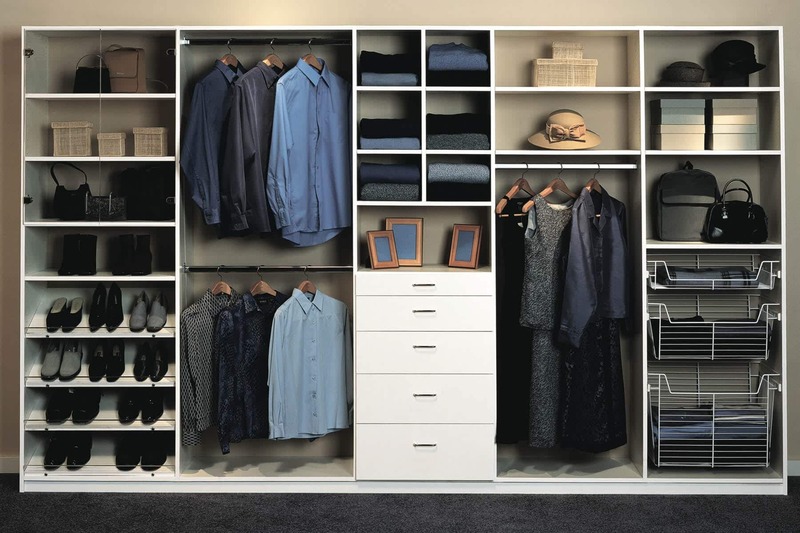 Our daily routine begins and ends in the closet, so we believe it should be a place of peace, organization, and beauty. 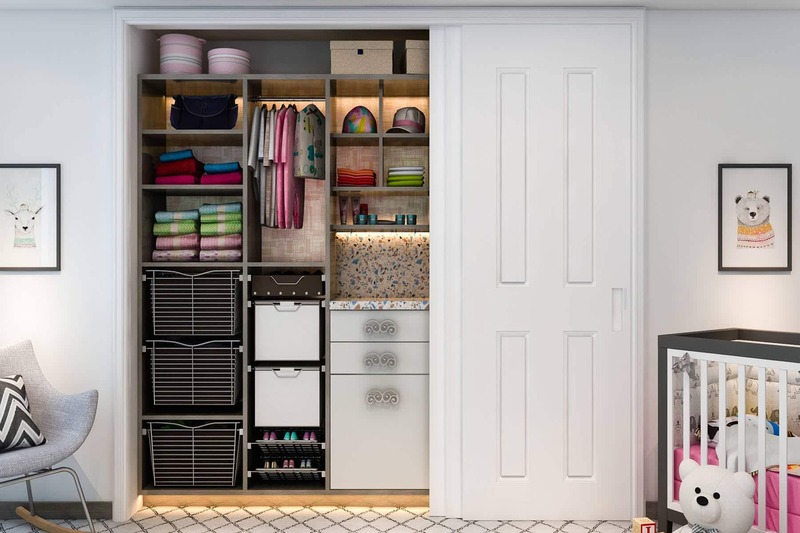 When it comes to the custom design of one of the most personal rooms in your home, our goal is to transform your closet into an organized storage oasis. 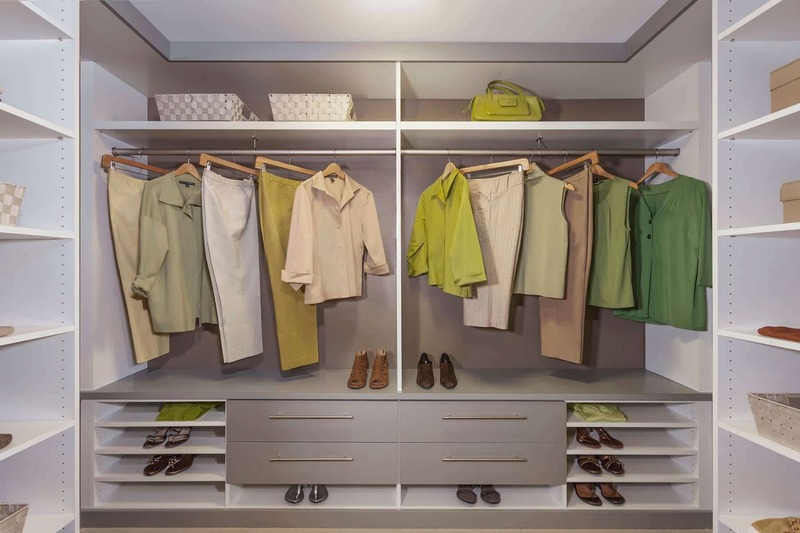 There are many benefits to be gained with a personalized closet design, one that includes rods, shelves, built-in drawers and cabinets, that allow you to easily find what you need, take charge of your morning routine, and discover a feeling of harmony to carry you throughout your day. 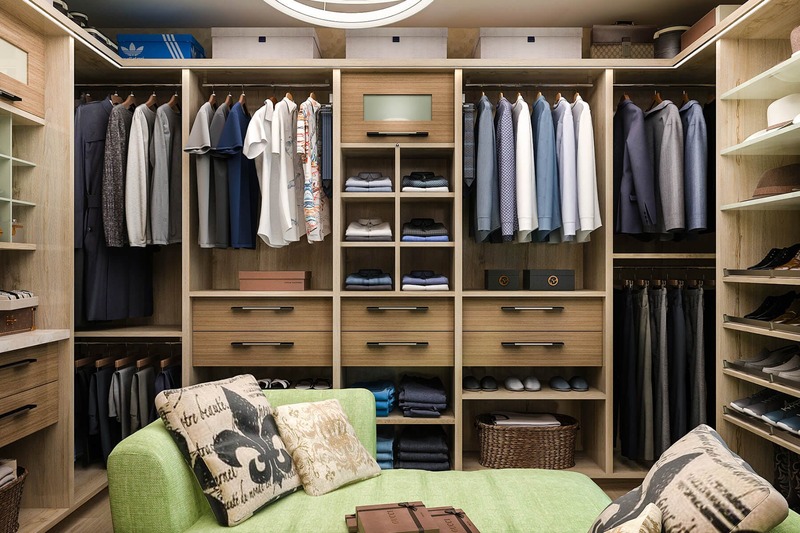 Our approach turns closet organization into art and your closet into a retreat. 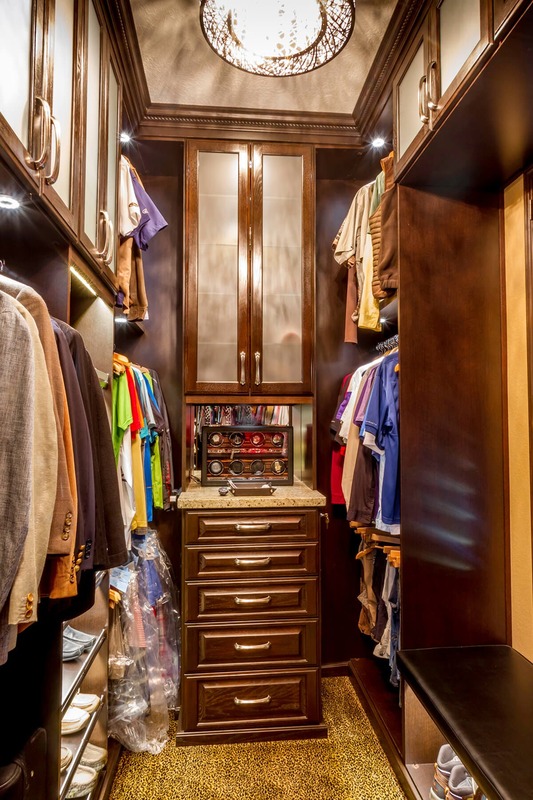 As a custom closet company we understand that everything in your closets are an expression of you, and your closet system should be no different. 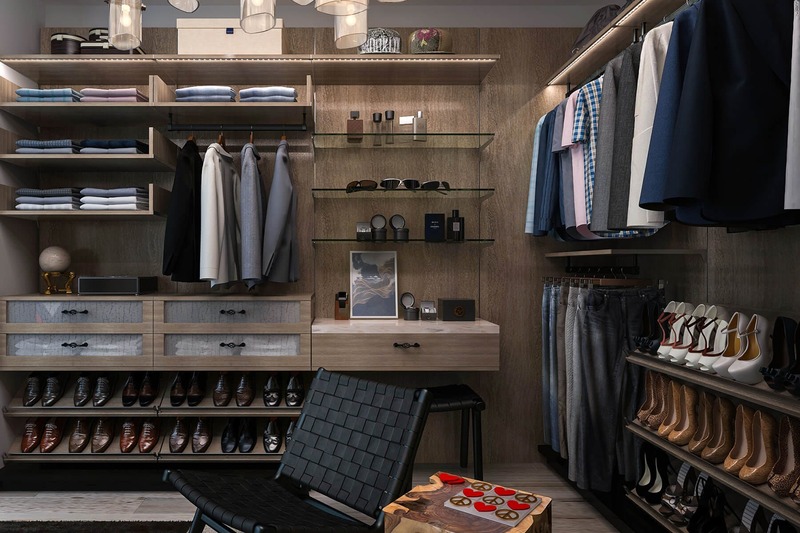 Whether your closets are walk-ins, reach-ins, or luxury dressing rooms, we have the vision and creativity to turn your dream into reality. 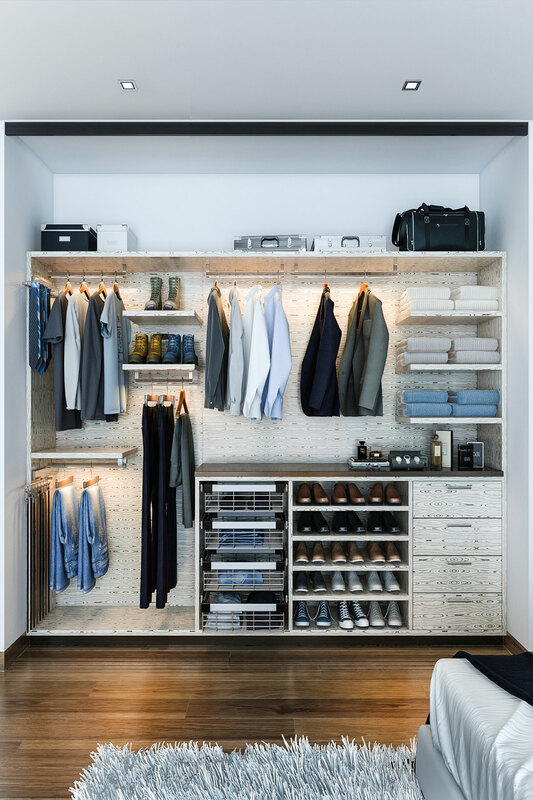 By collaborating with our designers, your wardrobe will be organized efficiently and designed with a focus on the way you dress. 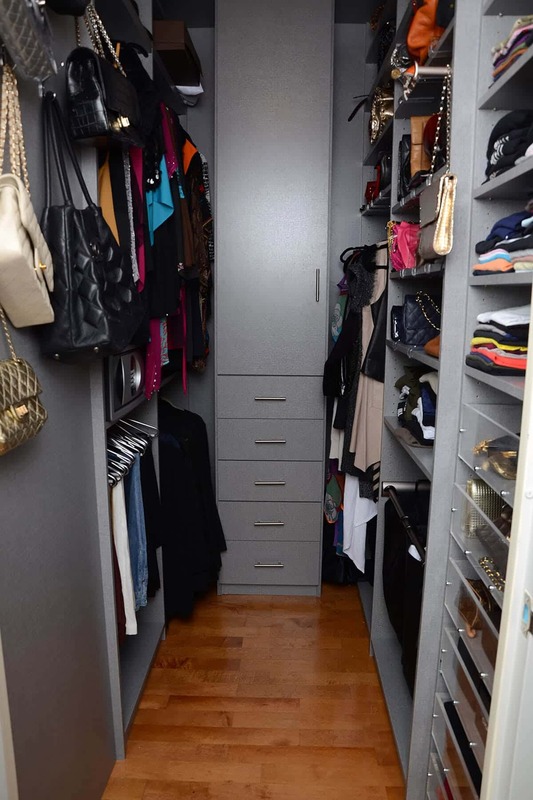 Your closet will be transformed so that you get more space, better organization, and a more attractive system. 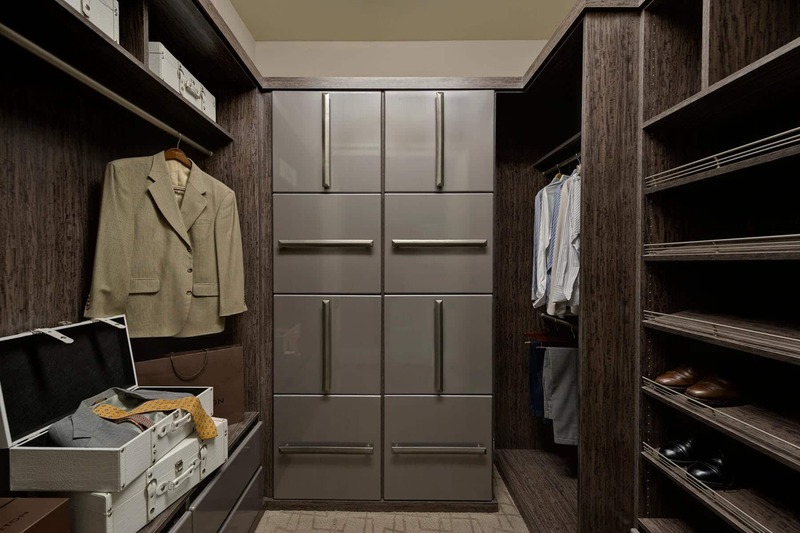 Personalized to your needs, we offer hundreds of ways to customize your closet design. 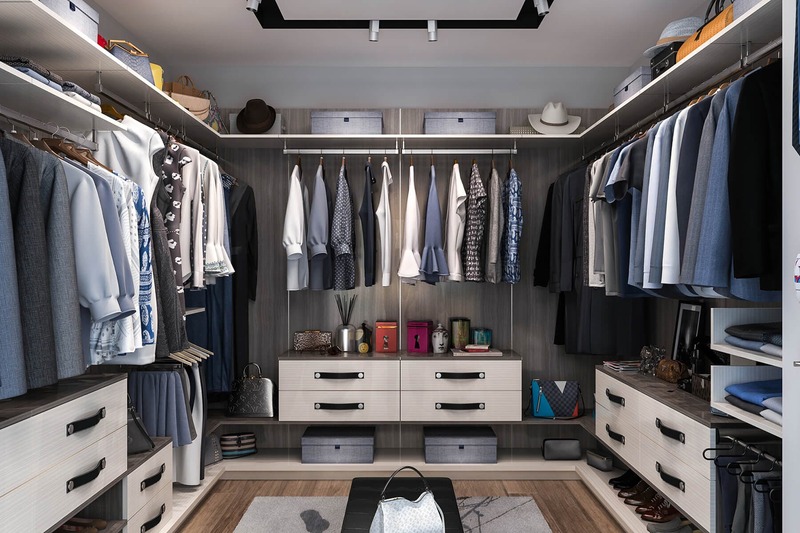 Your closet designer will help you select from a wide variety of accessories and elements that enhance your personal style while best conforming to your budgetary requirements. 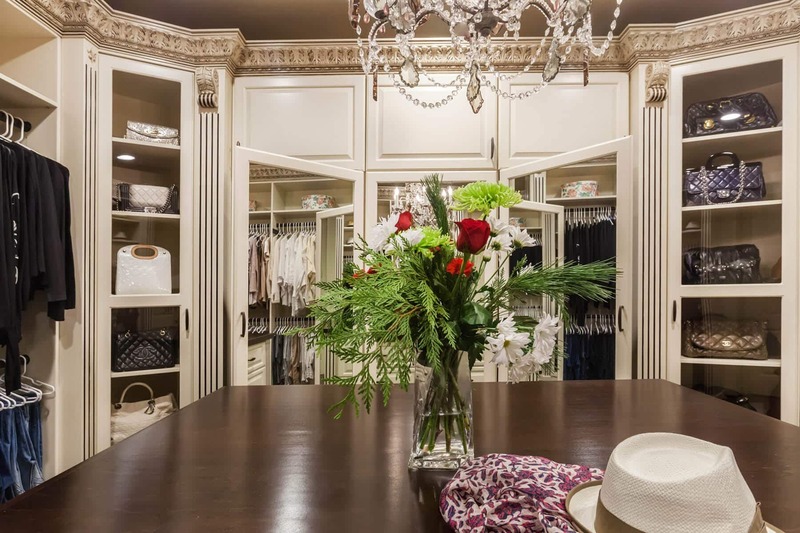 Whether your taste is contemporary, eclectic, or somewhere in between, you are guaranteed to find the finishes, moldings, and embellishments you will love so that we can create a design that’s uniquely yours. The art is in the details. 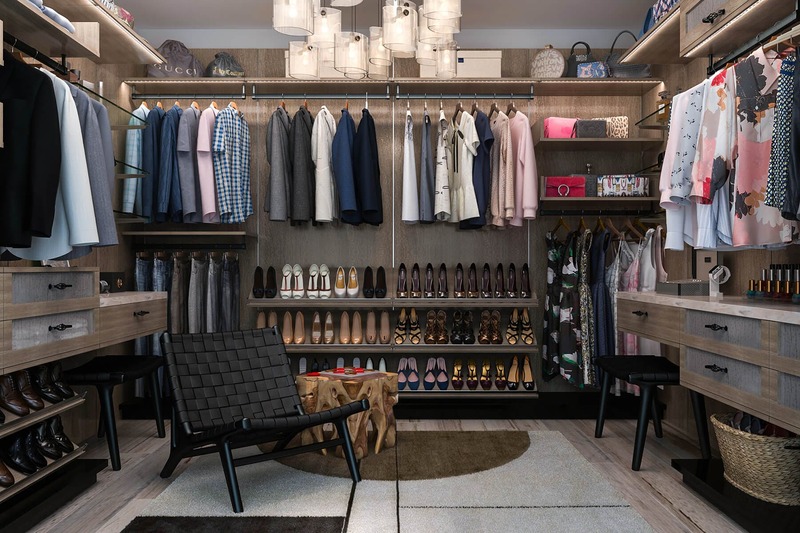 With a focus on perfecting even the smallest aspects of your closet design, your designer will introduce you to our complete selection of embellishments, finishes, and accessories during your in-home design collaboration. 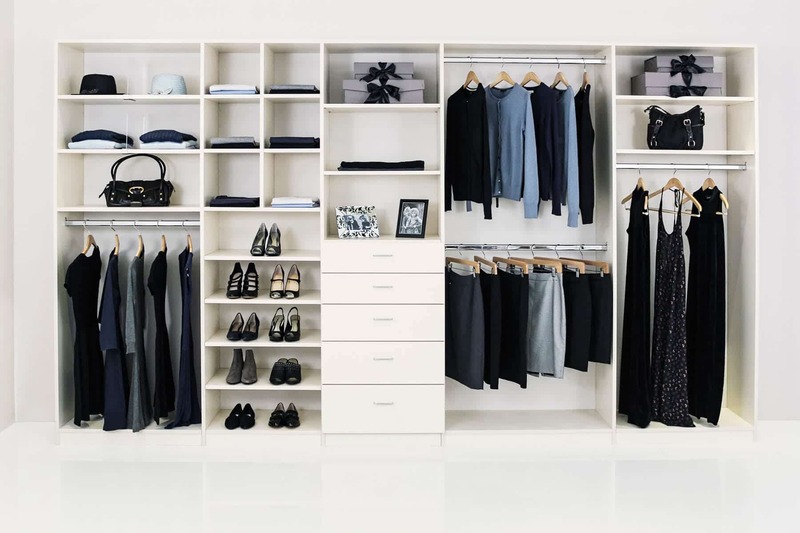 Featured items are a sampling to introduce you to our fashion-forward offering that helps keep everything you plan to store in your closet organized. Click on any item below to view all available options. Great for fast and easy touch up of items. 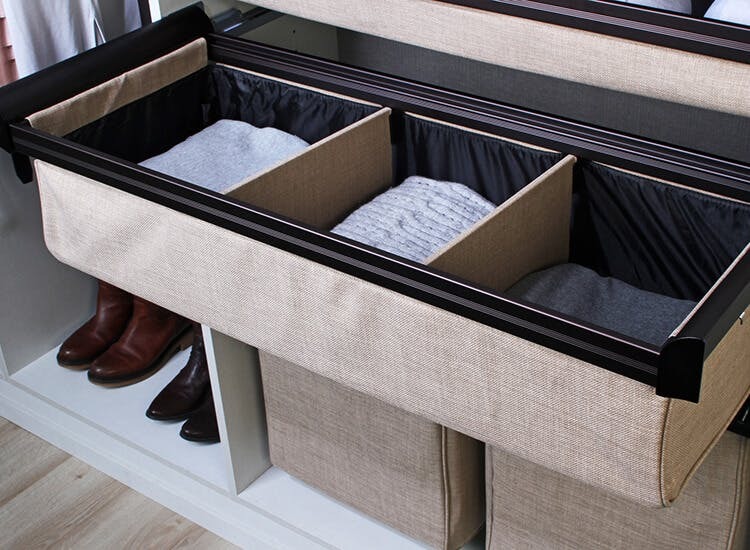 A nice alternative to drawers. The lip keeps items in place. 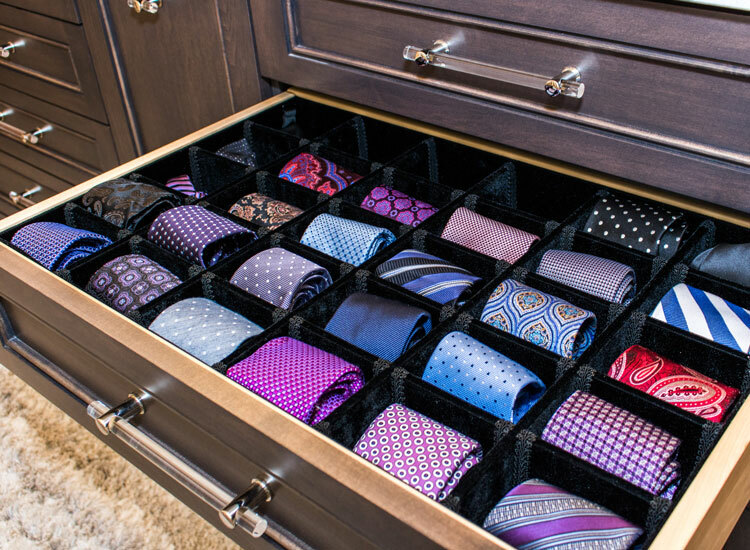 Maximize tie space by rolling them in a custom velvet insert. 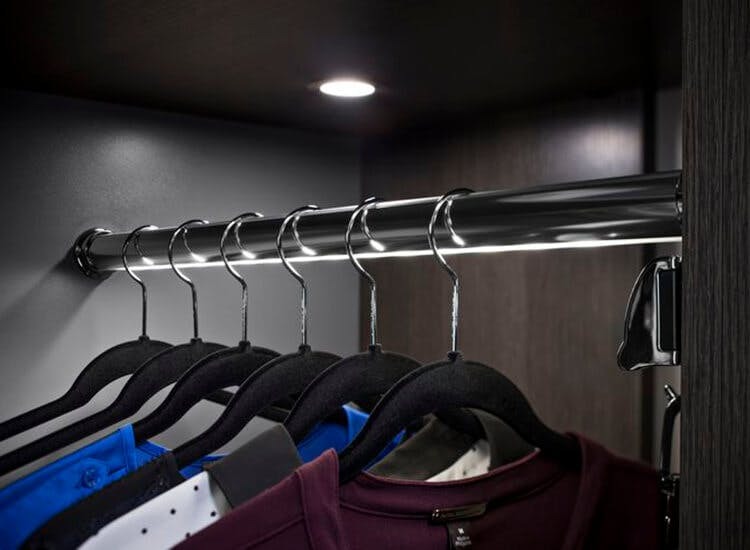 Illuminate sections of your closet with LED rods. Top mount, oval, and round options available. 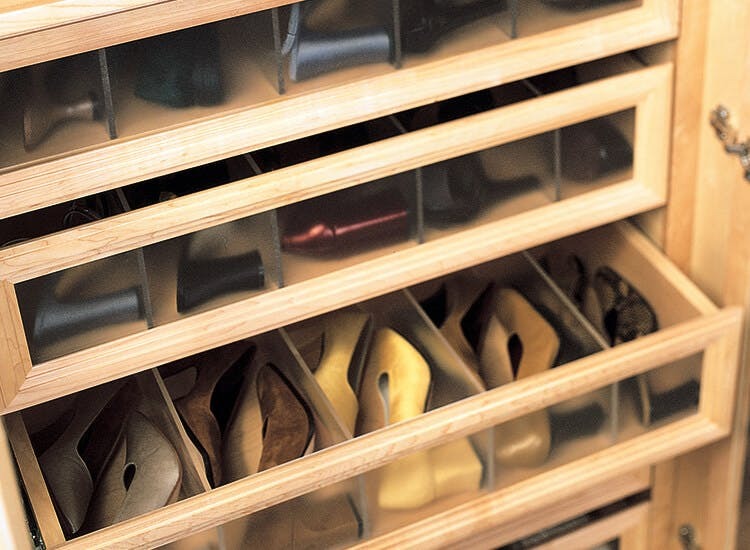 Section off drawers with Lucite dividers to keep them organized. 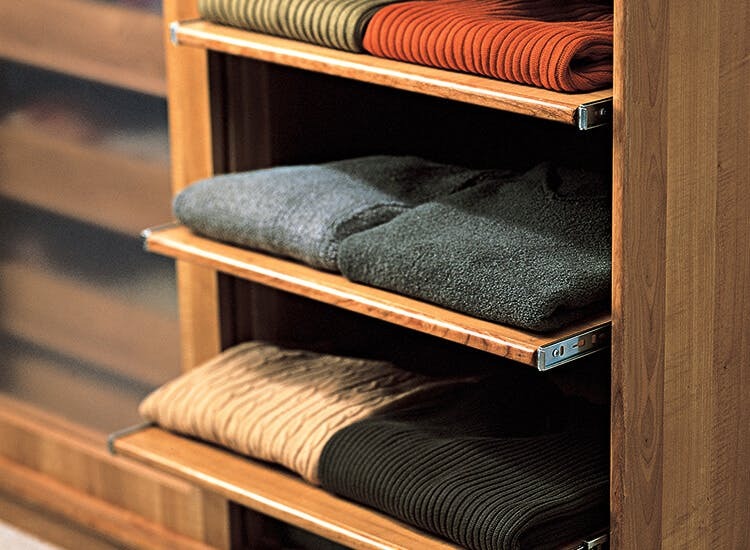 Store and protect from dust your belt collection in this two-sided cabinet. 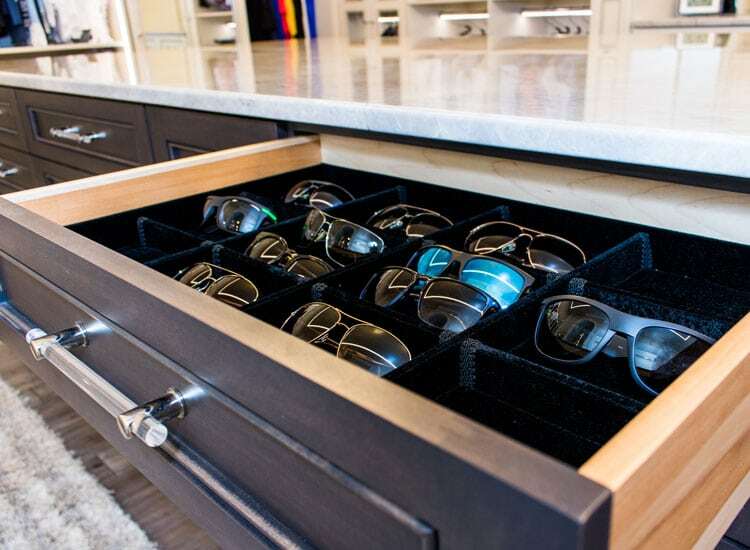 Display and protect sunglasses in this handmade padded velvet lined drawer insert. 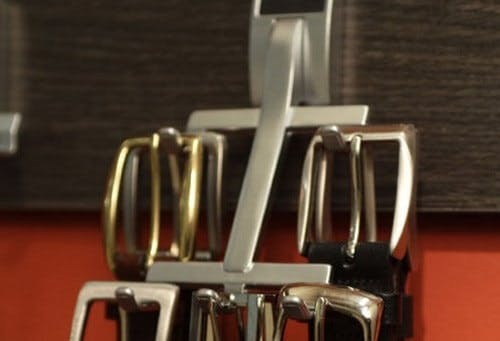 Use open space on walls to store belts with these modern wall-mounted hooks. Each one is handmade to order. 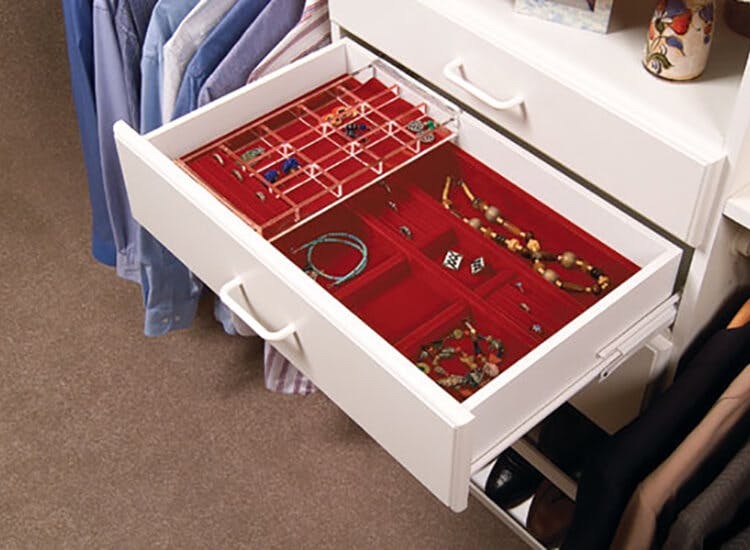 Select from velvet or silver cloth plush-padded jewelry drawers. A double decker is shown. 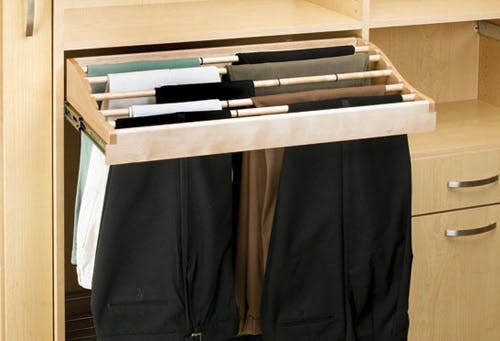 Wood pant organizer with multiple uses. 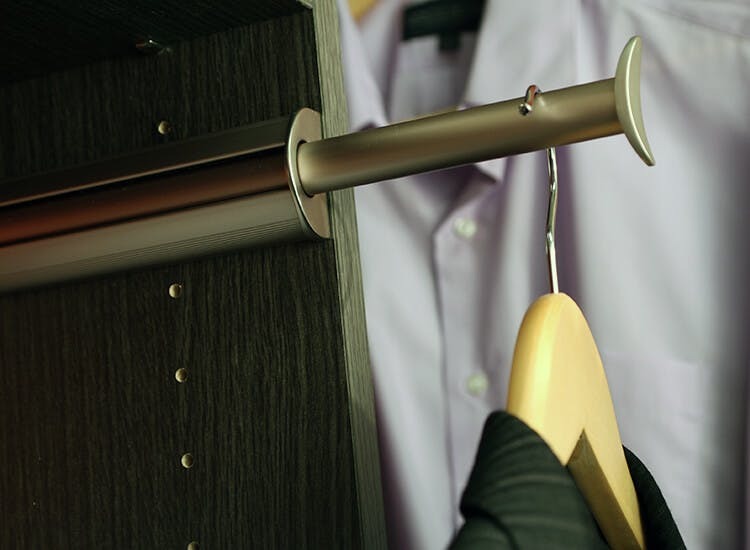 Store linens, shawls and slacks. Our thermofused melamine is pressed directly onto pinecore substrate. Our thermofused melamine is pressed directly onto pinecore substrate. Matte and gloss available. 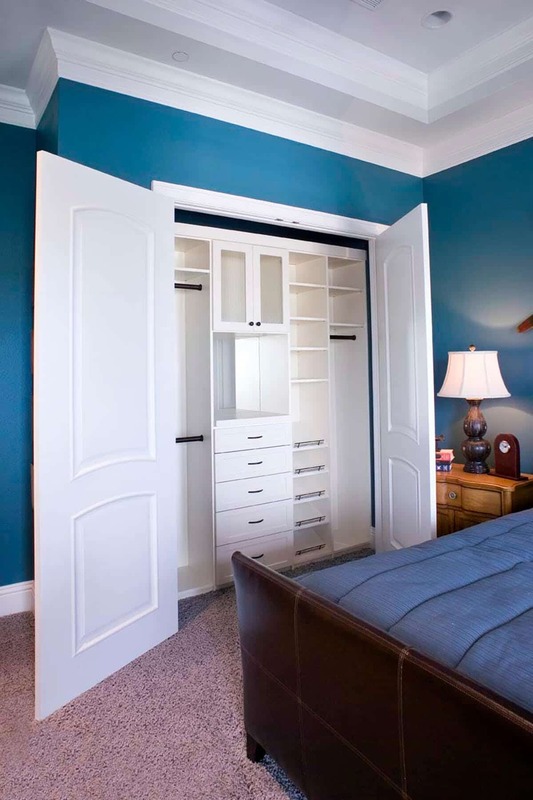 Update reach-in closet sliding doors with popular new styles. 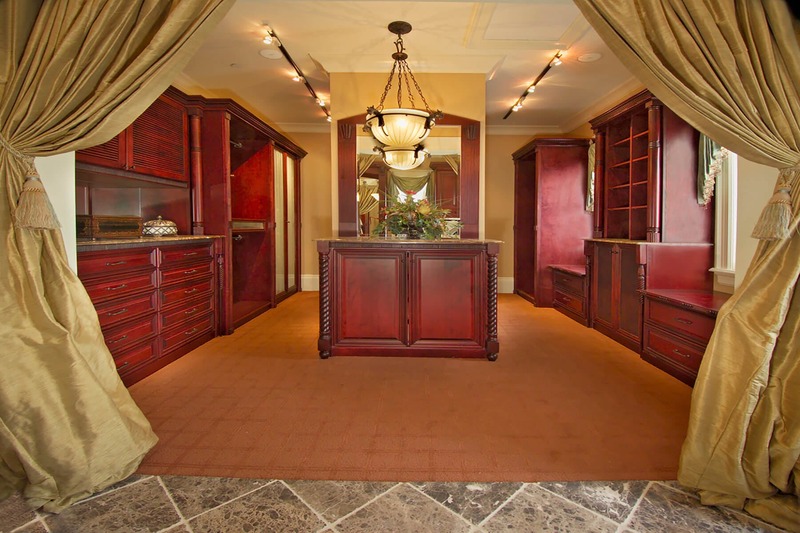 Select from seeded, reeded, sand blasted, bronze, and much more. 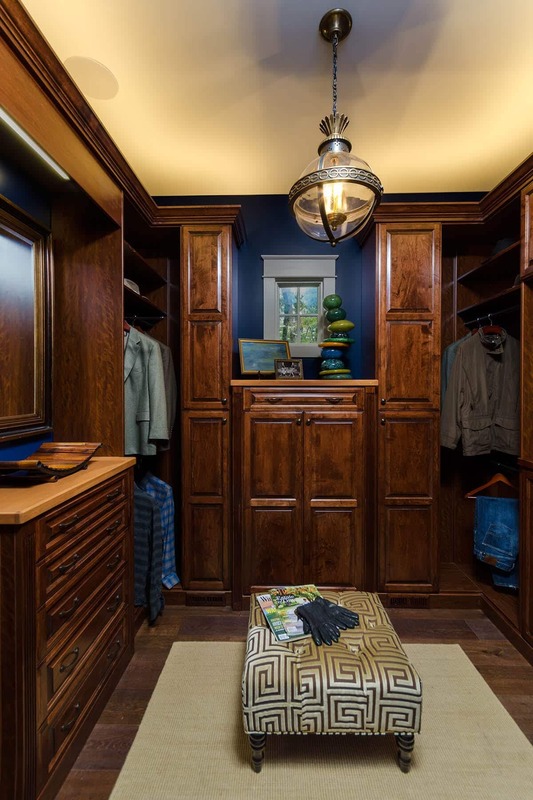 Top off your unit with one of our many classic crown moldings. Wood and RTF available. 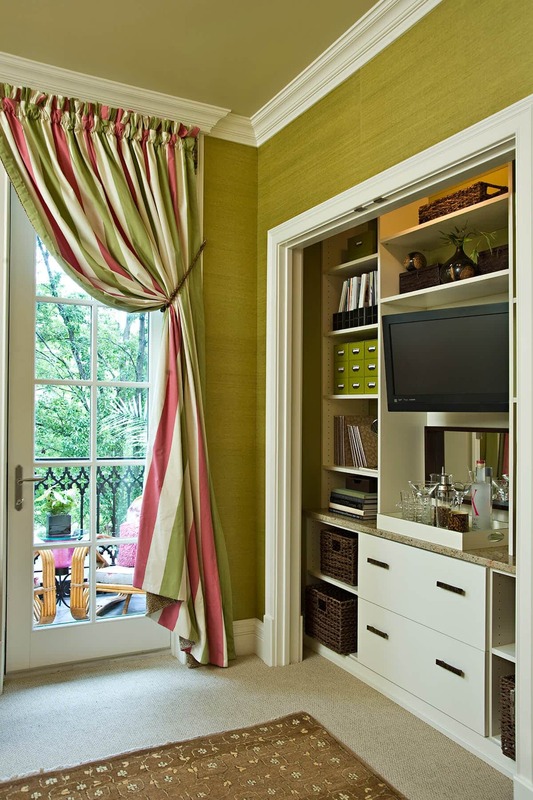 Architectural elements can be added to enhance door fronts, columns, and valances. 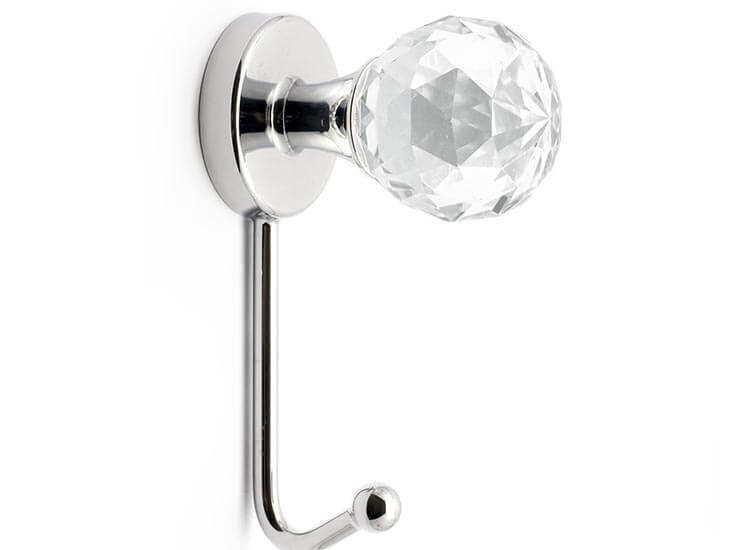 Add luxury to door and drawer fronts with unique Swarovski crystal pulls. Nothing adds sparkle like faceted Swarovski crystals in a variety of styles. 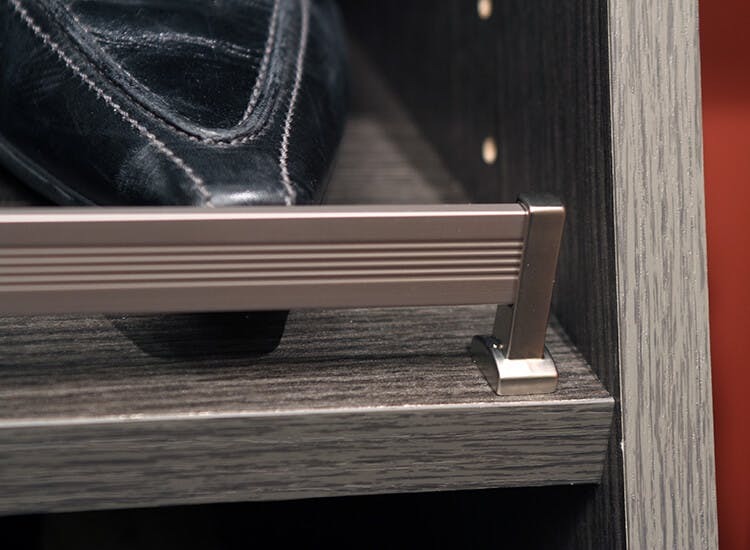 We offer an extensive selection of handles and knobs to complement the style of your design. 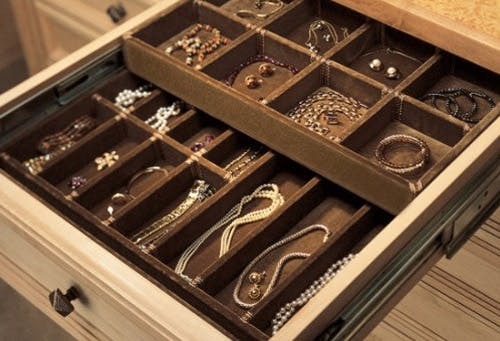 Adorn your drawer and door fronts with their own jewelry. Add precious stones to faces. 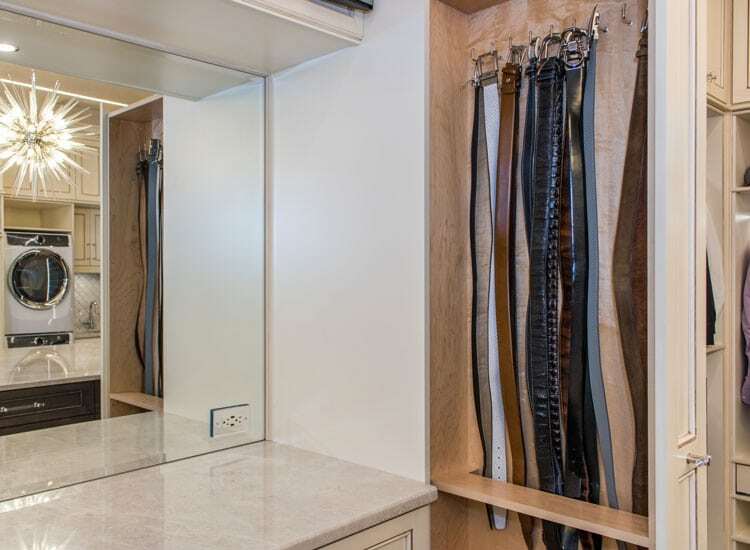 Personalize your drawer and door fronts with leather. 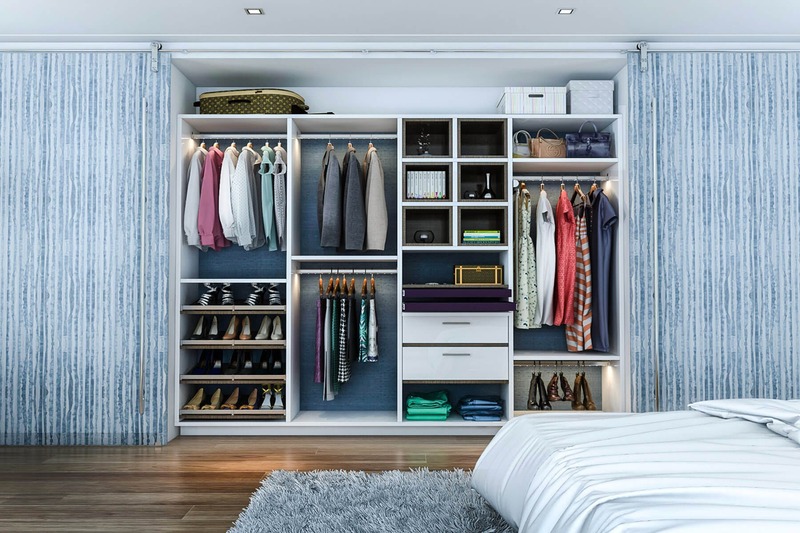 Mix and match styles and colors to create the perfect blend of your unique design preferences. 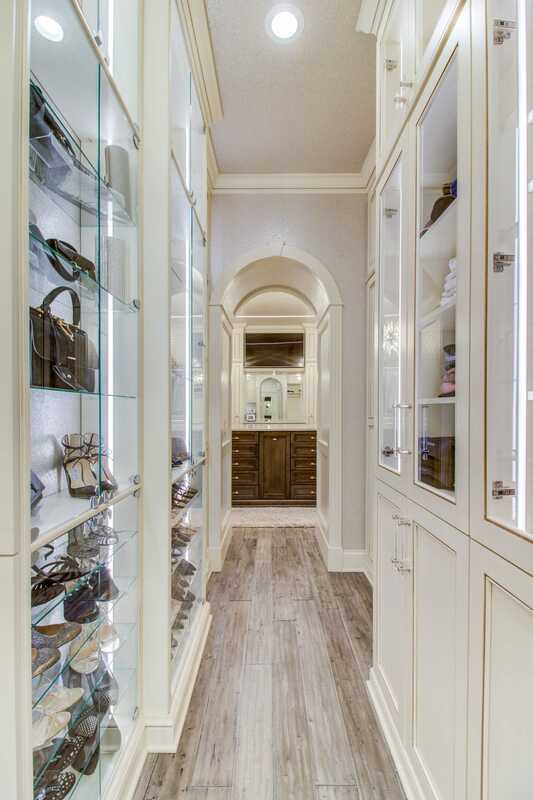 Enhance the edges of your shelves, panels, and counter tops with solid wood edges. 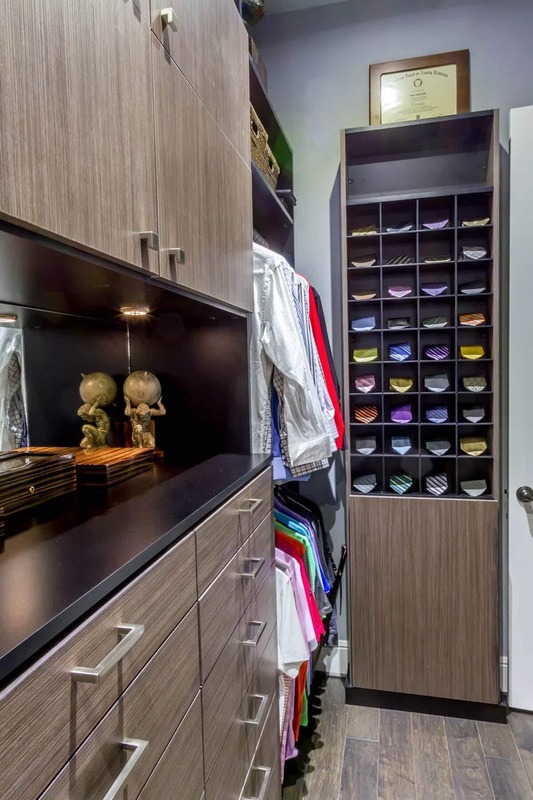 We offer a variety of profiles to match your personal taste. 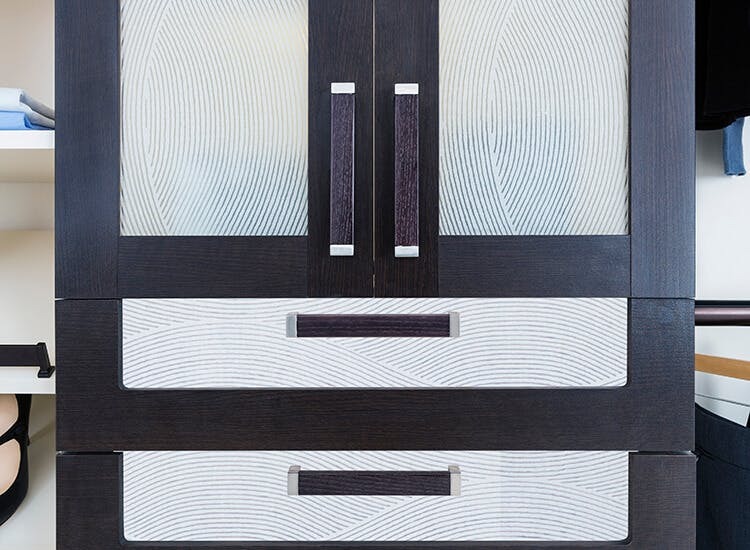 Exotic resins add unique designs in framed doors and drawer fronts. Selections range from spun silver to organic flowers and grass. 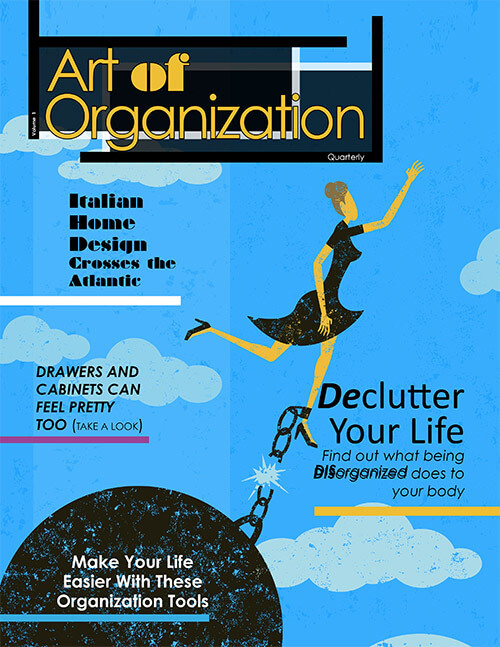 Discover the latest design trends, lifestyle tips, and storage solutions that mold organization into art. Please Note: Available accessories vary by location. 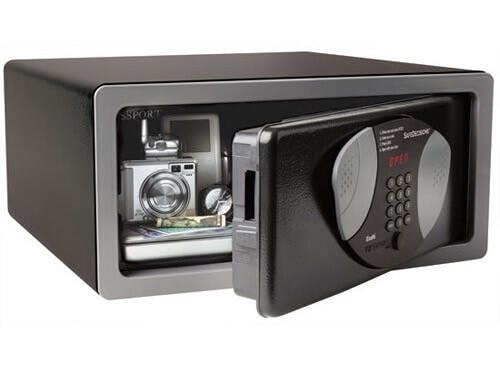 Digital wall safes can be hidden behind hanging sections, bookshelves, or in cabinets. 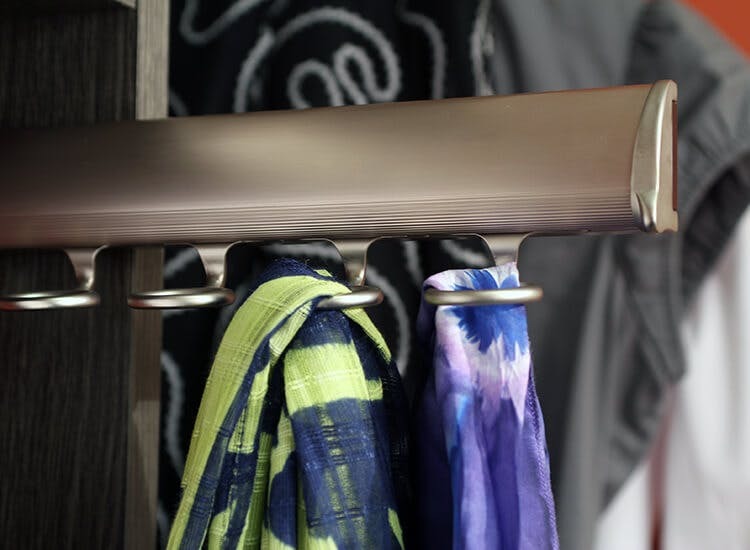 Works well for pants, shawls, and table linen storage. 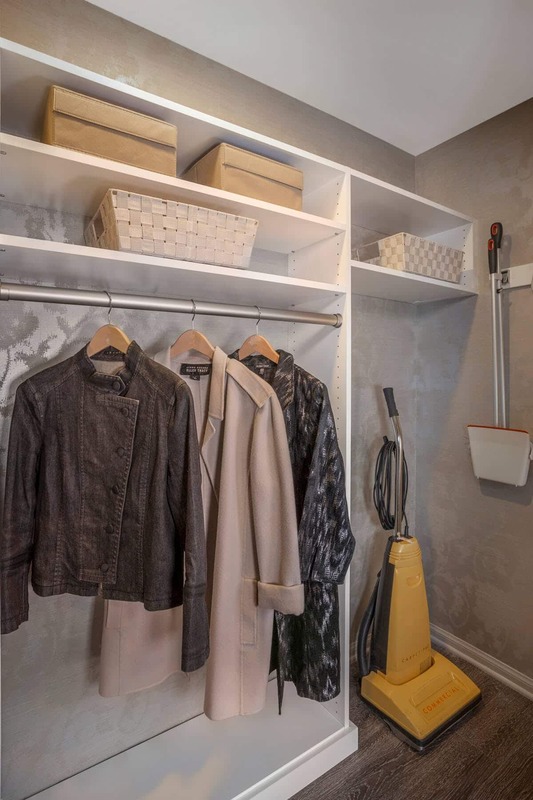 Hangers included. 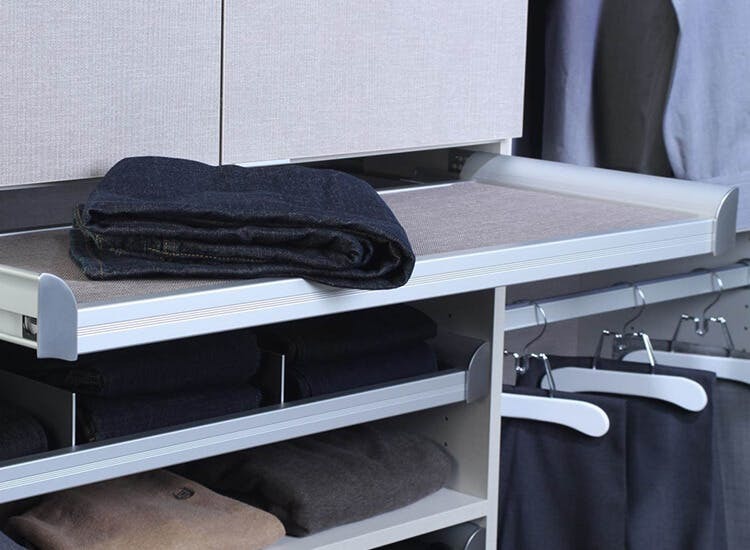 For folded items, our fabric pull-outs are a great alternative to drawers or shelves. Select from the colors beach or slate. 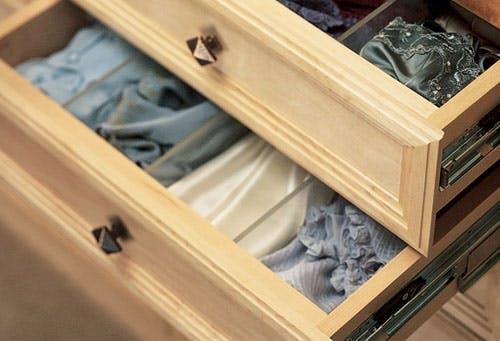 Store lingerie, socks, or small folded items in divided fabric trays. 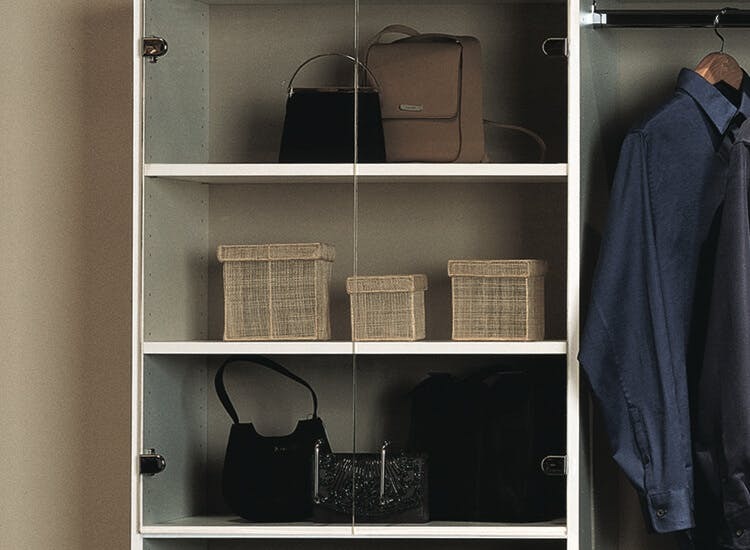 This pull-out is offered in slate or beach and is a stylish alternative to a standard drawer. 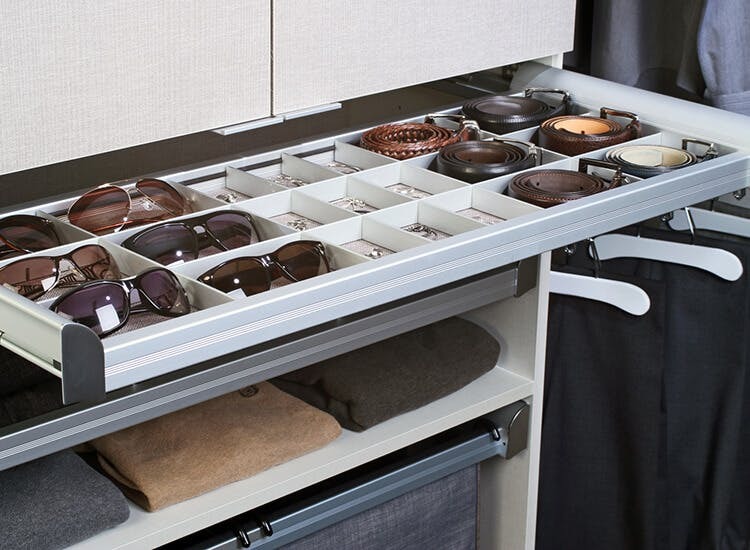 Space-saving trays are perfect for hard-to-store sunglasses, jewelry, rolled belts, and ties. 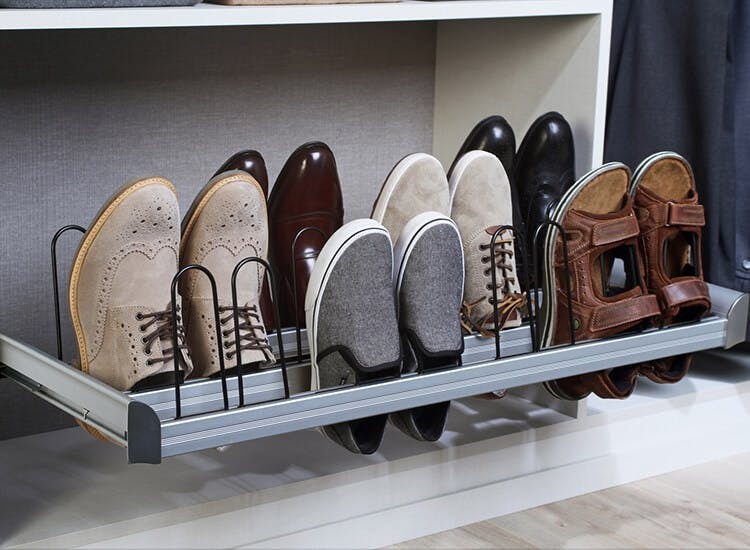 Space-saving shoe organizers slide out and tuck back neatly out of sight. 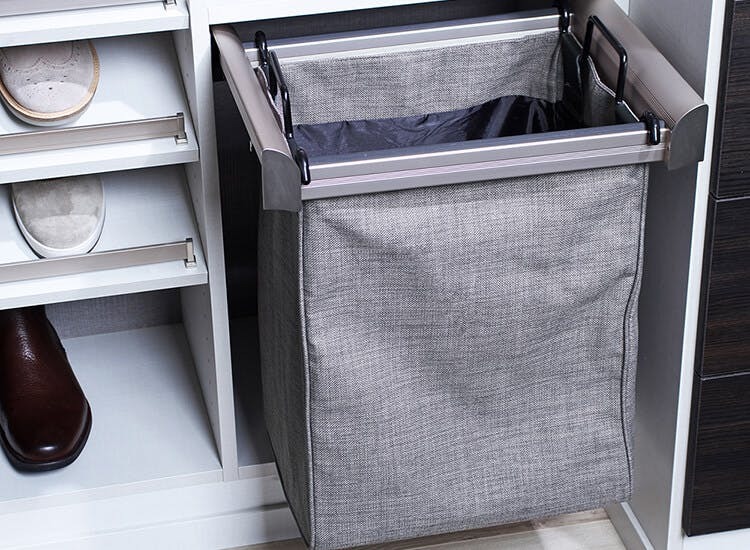 Double hampers are great for sorting or separating laundry and easily lift out. Select from the colors beach or slate. 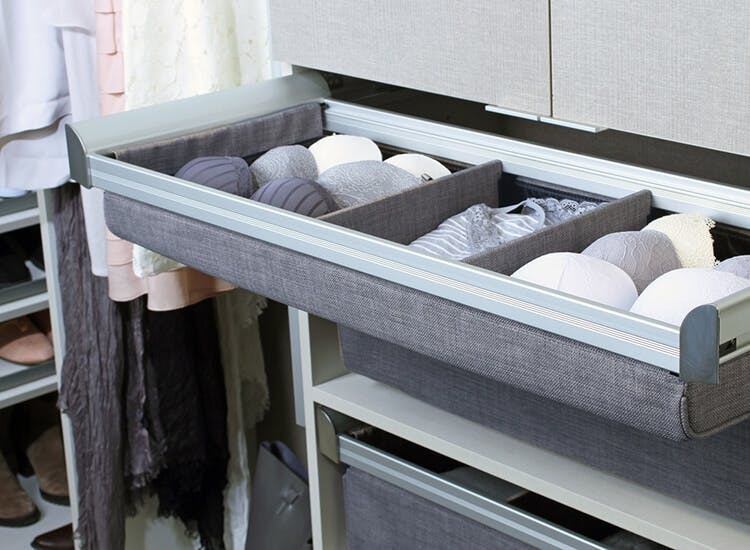 Add matching drawer fronts to fabric pull-outs to change up the look. Mix and match to create your own unique design. 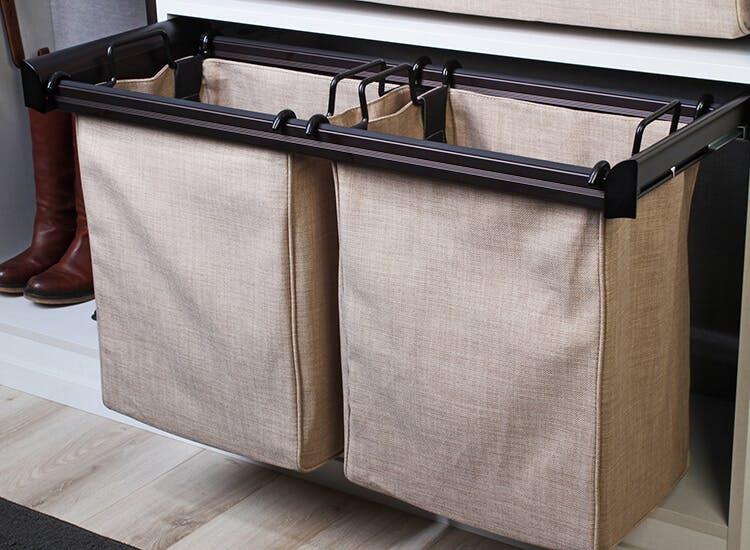 this laundry organizer lifts out easily with handles and comes in the color slate or beach. Give laundry a more formal look with a tilting hamper. 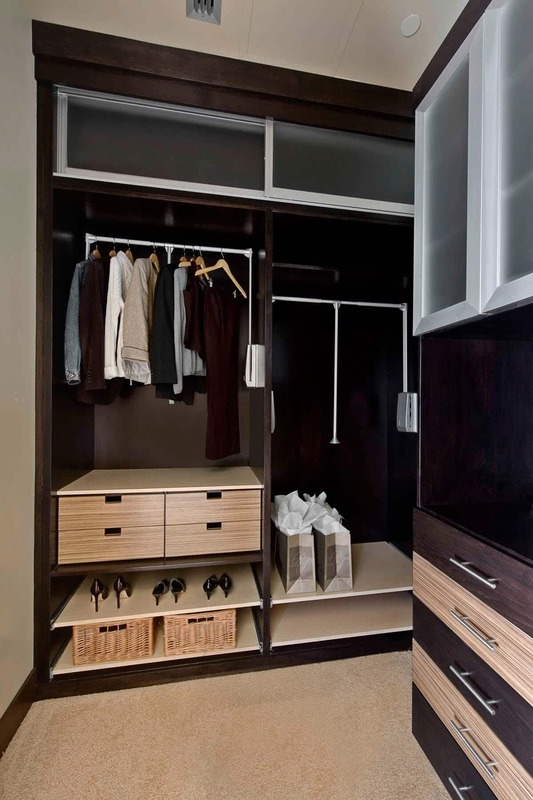 Hide unsightly dirty laundry behind the door front of your choice. 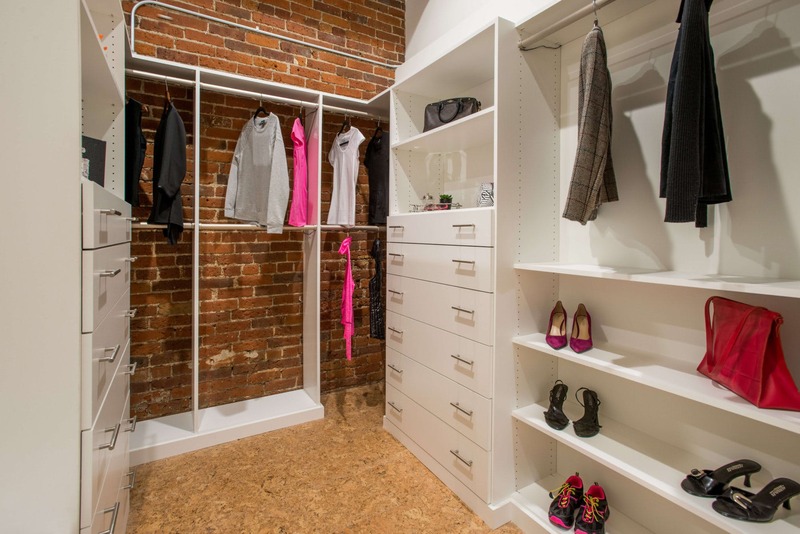 Perfect spot for temporary hanging, packing, or dry cleaning. Comes in all finishes. 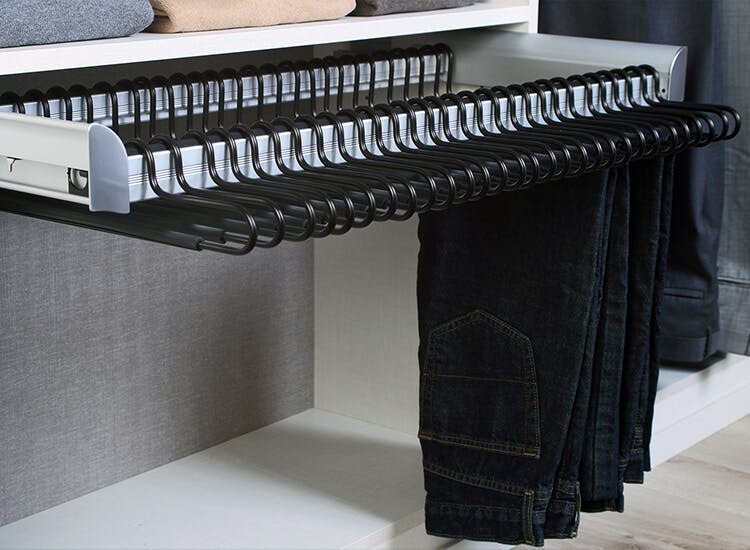 Organize belts on sliding racks that tuck neatly into hanging sections. 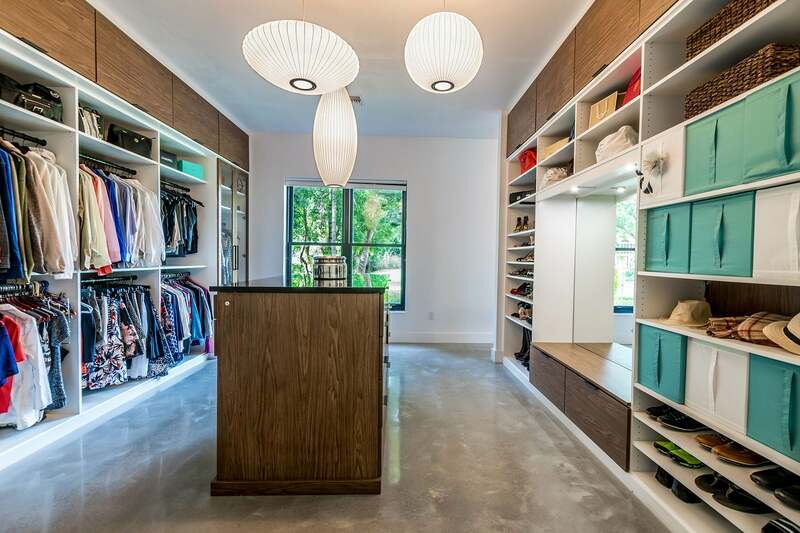 Offered in all finishes. 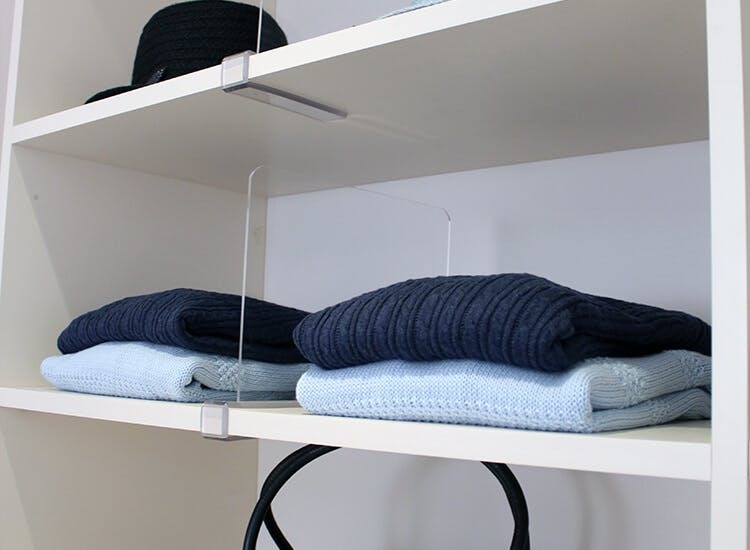 Scarves are often difficult to store, but not with this scarf organizer. Comes in all finishes. 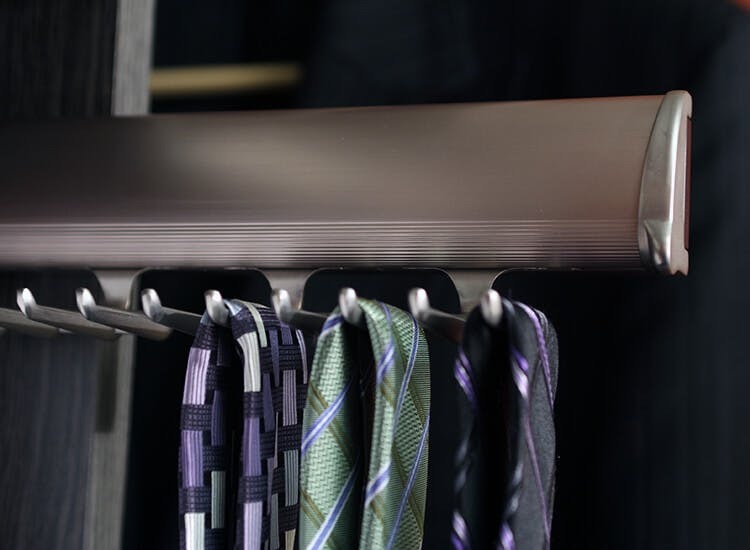 Preserve ties on our tie organizer. Stores neatly in hanging areas. Comes in all finishes. 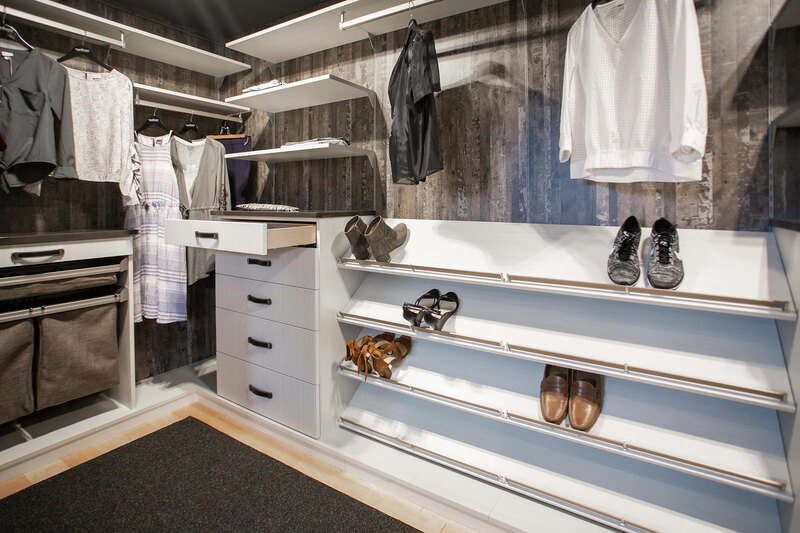 Slanted shoe shelves with Elite toe stops. Available in all finishes. 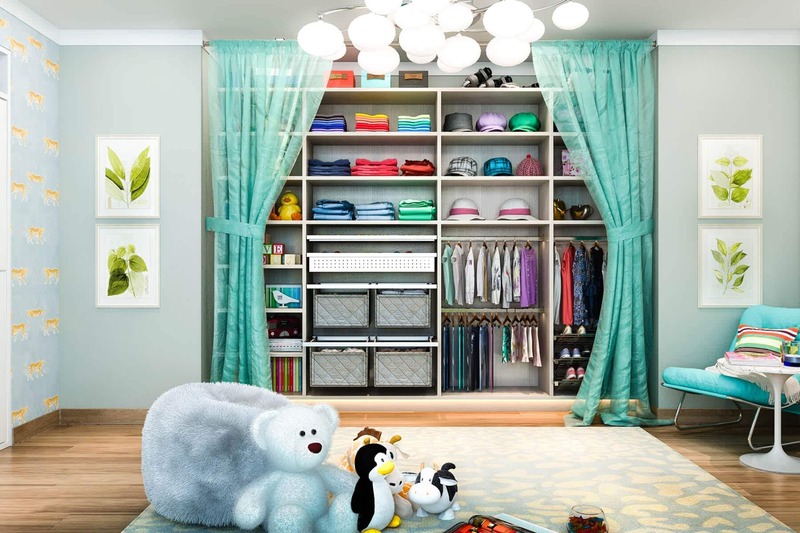 Create cubbies anywhere you like with clip-on Lucite shelf dividers. 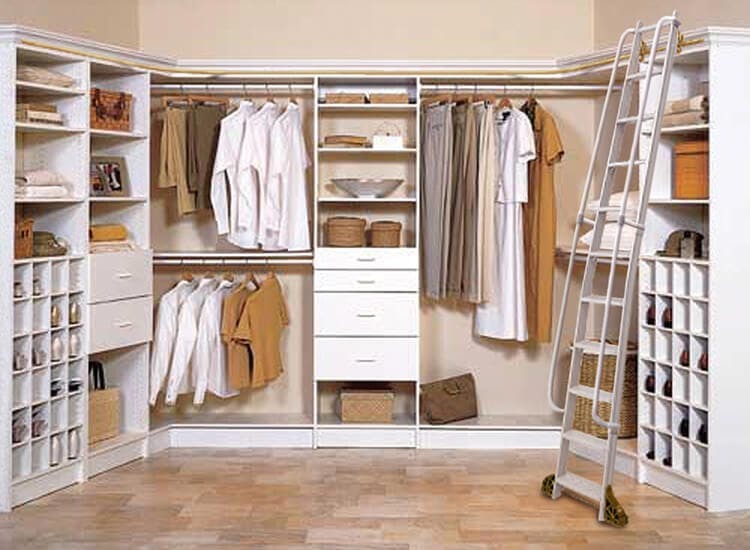 Aluminum closet ladder reach triple tier hanging rods and storage on top shelves. 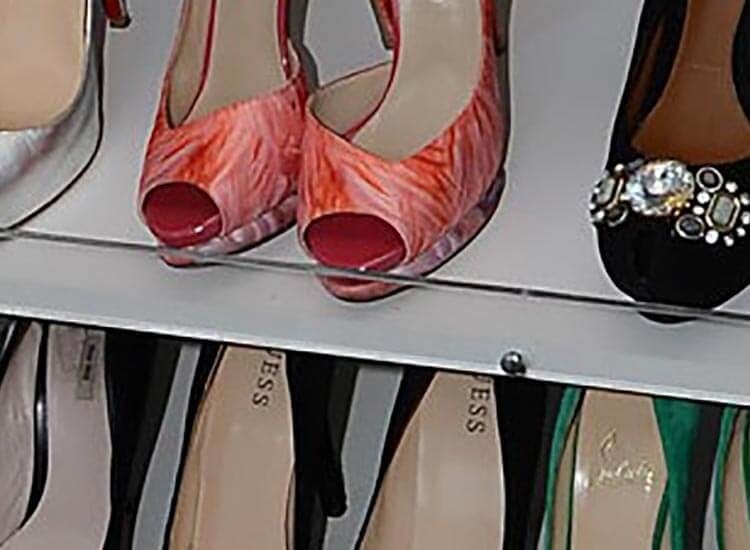 Display shoes using popular slanted shoe shelves with Lucite toe catch. 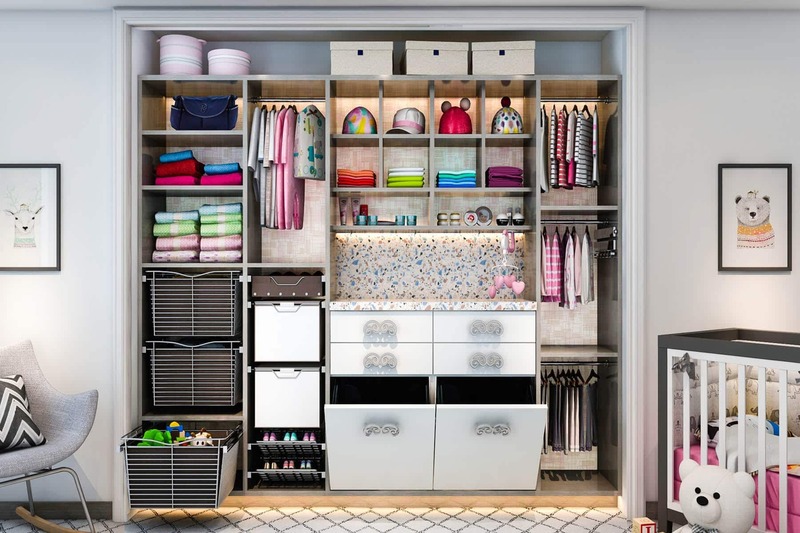 Make items on low or deep shelves easy to reach with pull-out shelves. 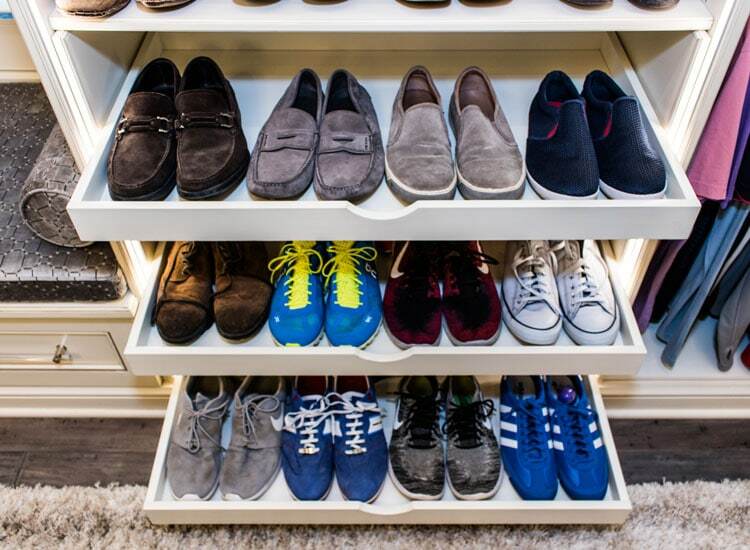 Store shoes in trays with dividers that allow air to circulate. 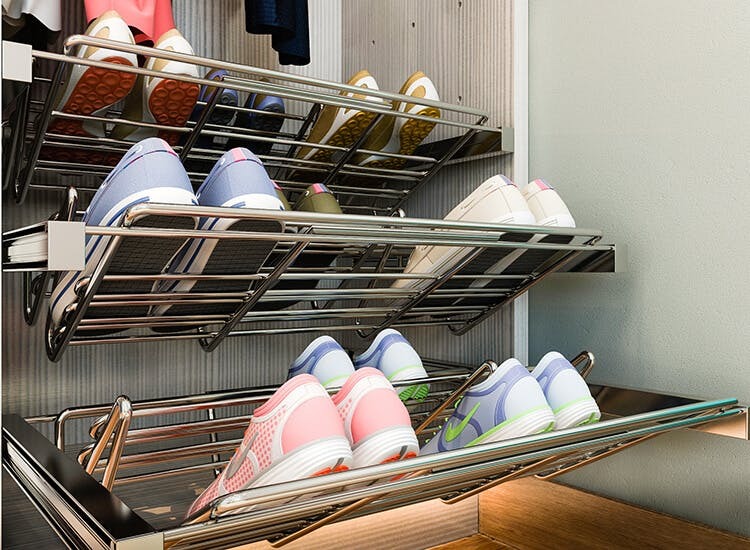 Trays helps keep shoes dust free and easy to see. 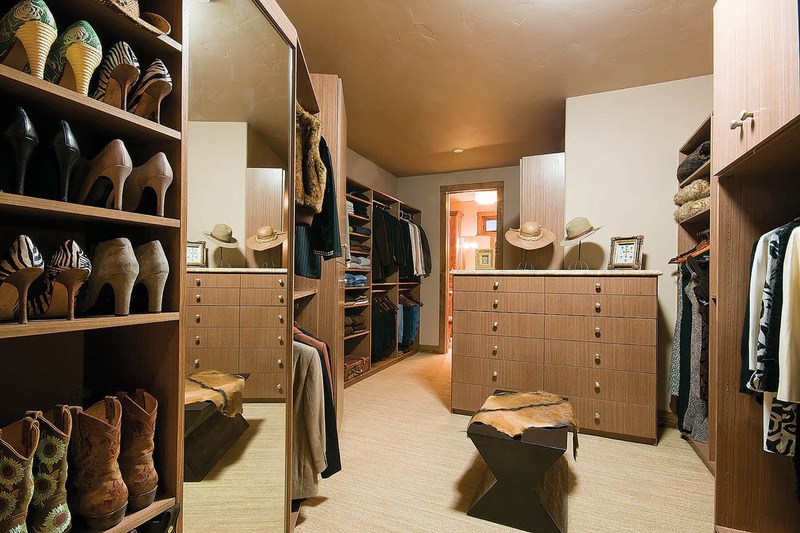 Place handbags, sweaters and other favorites behind clear, matt, bronze or black Lucite doors. 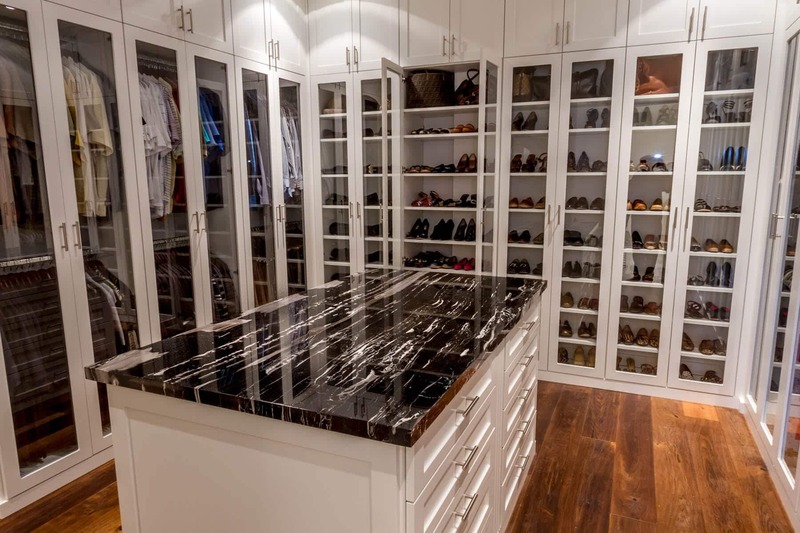 Select a Lucite or resin insert and add it to our exclusive framed doors and drawer fronts to create a unique look all your own. 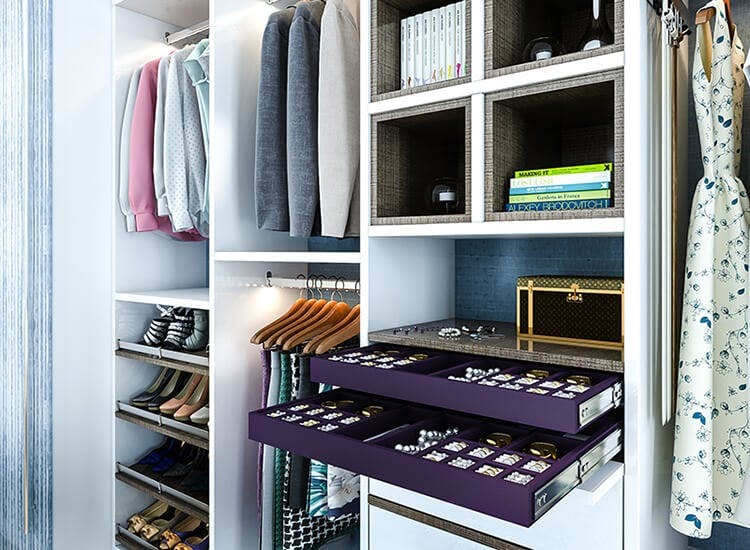 Turn drawers into jewelry boxes with our selection of jewelry inserts. 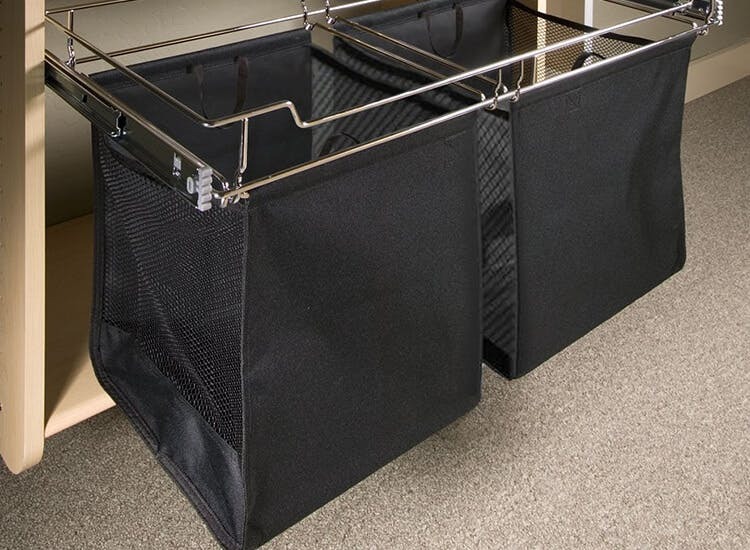 Maximize shoe storage with double tier wire trays. 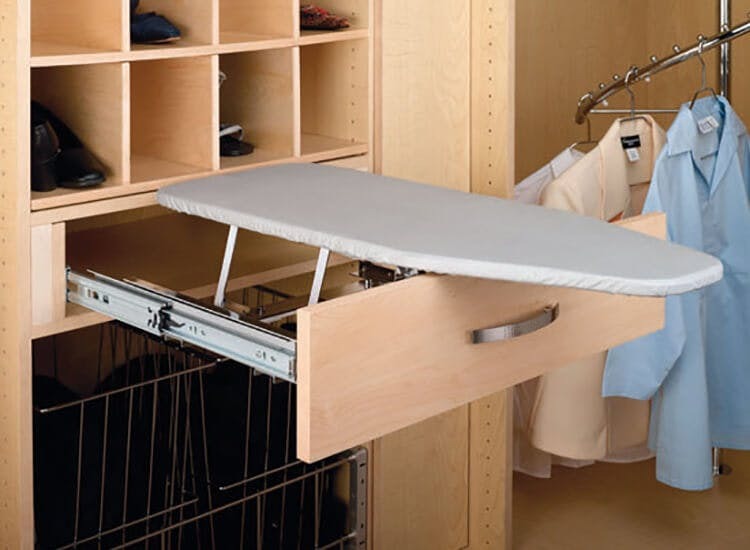 Perfect for touch-ups, this ironing board tucks away in a small drawer in your closet or laundry room. 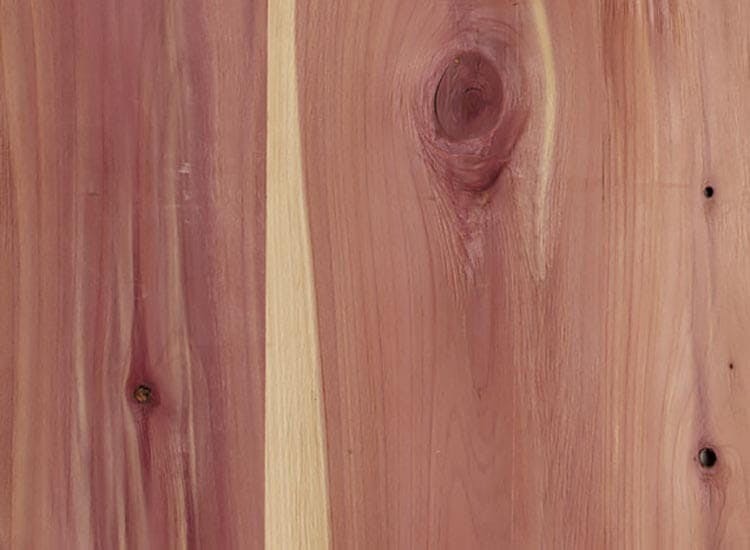 Add a touch of aromatic cedar to the back of your closet or in the lining of a drawer. 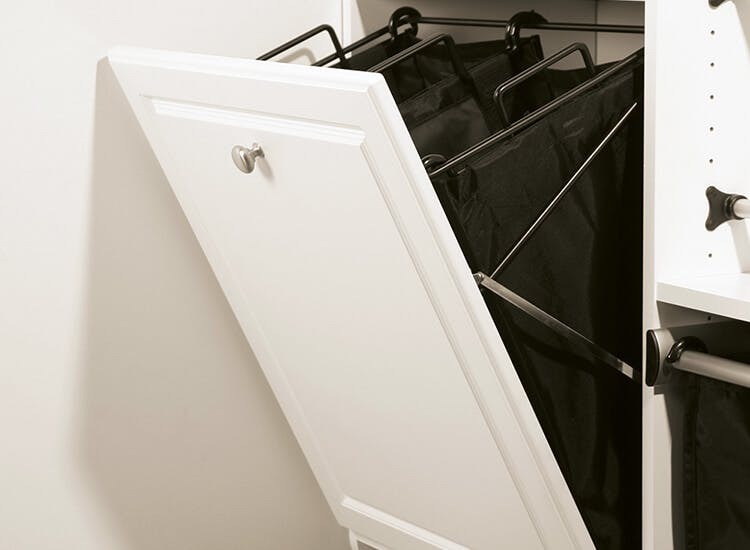 Black nylon laundry bags make sorting easy, and are easily removed for trips to the cleaners or washing machine. 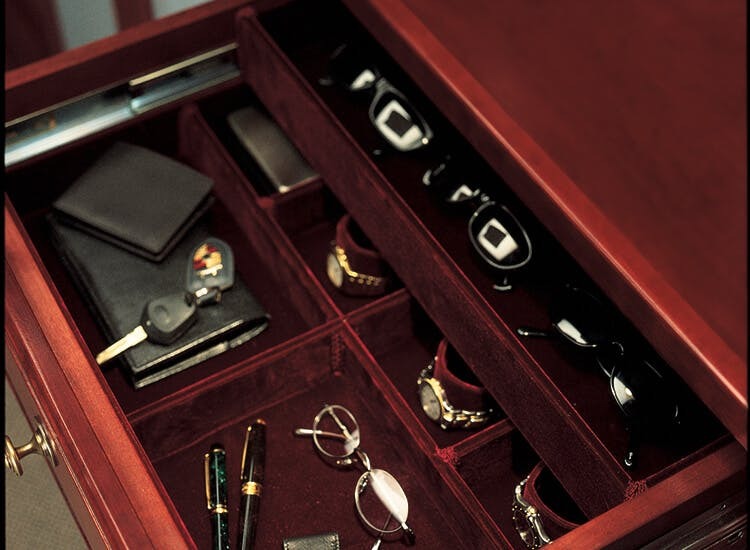 Velvet handmade valet drawers keep watches, keys, and wallets easy to find. 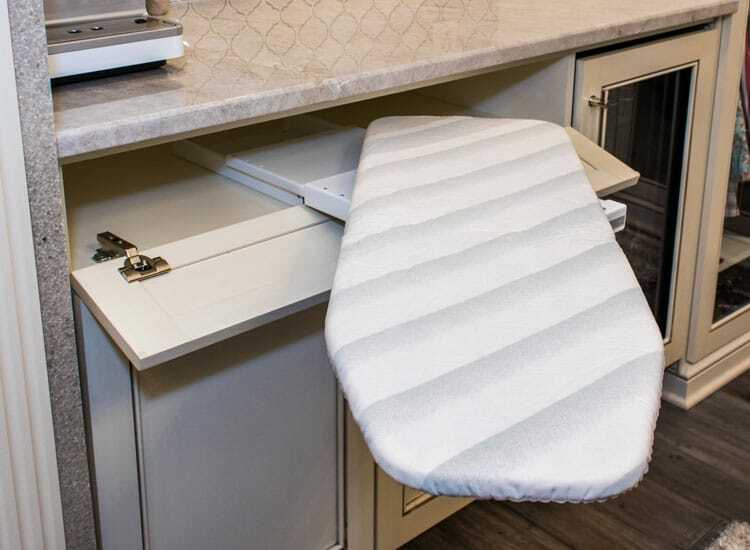 Slide out and fold or use as a temporary spot to sort your items. 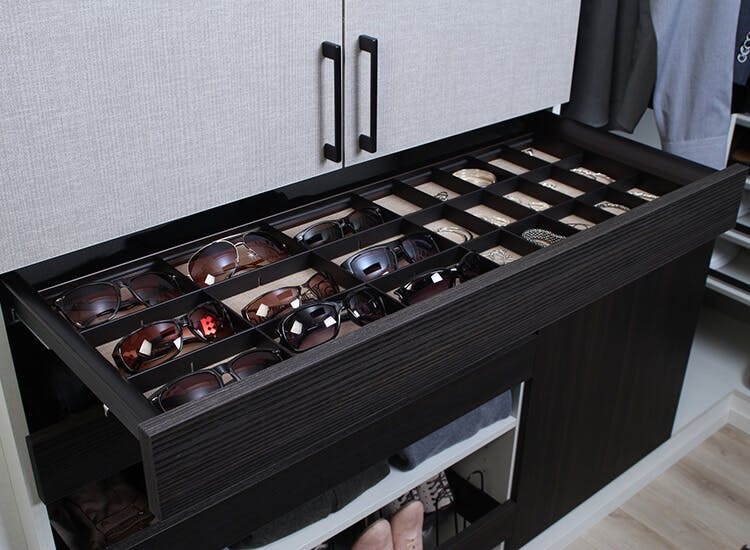 Line trays or drawer bottoms with velvet to store jewelry, watches and other valuables. 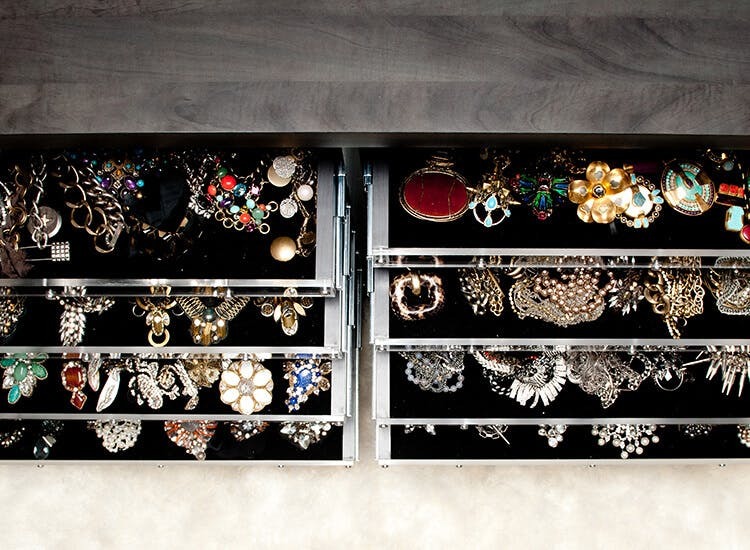 Add pull-out jewelry trays to keep all your jewelry organized. 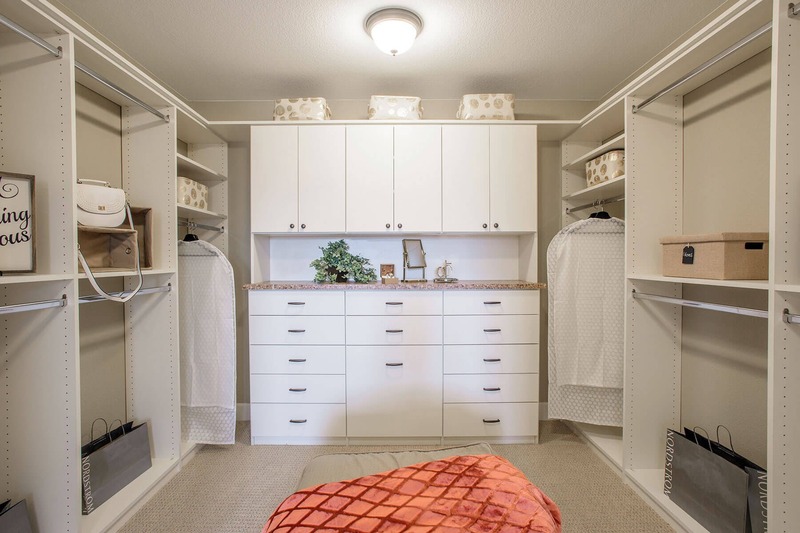 Dress up mudroom units or use as a spot to hang robes or jackets in your closet. 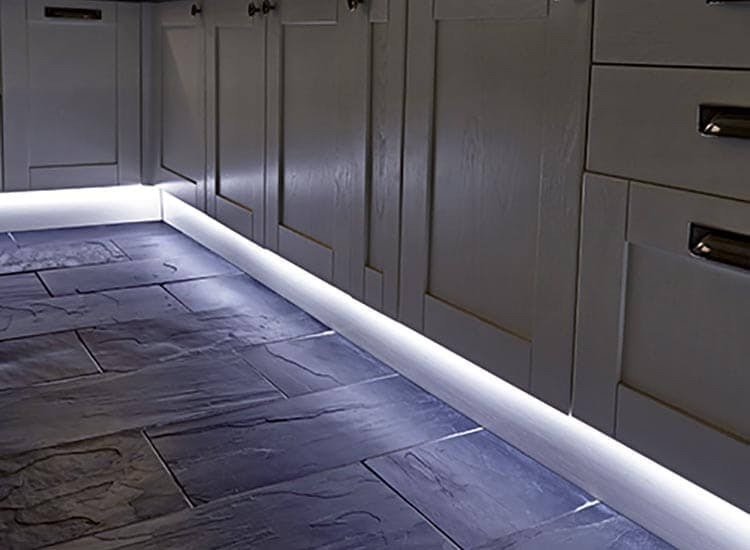 Create the perfect mood with strip lighting. Great for kick plates and other strategically-placed areas. 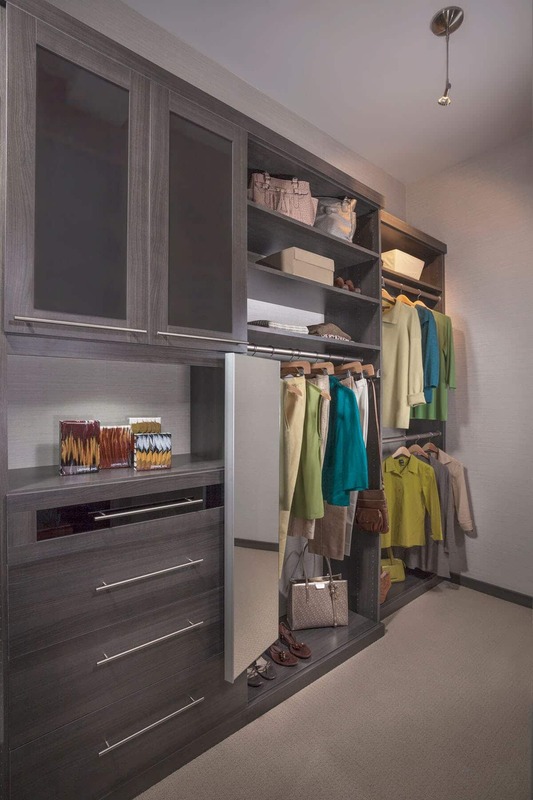 Under shelf lighting creates a boutique feel for closets, and helps create a mood for all shelf display areas. 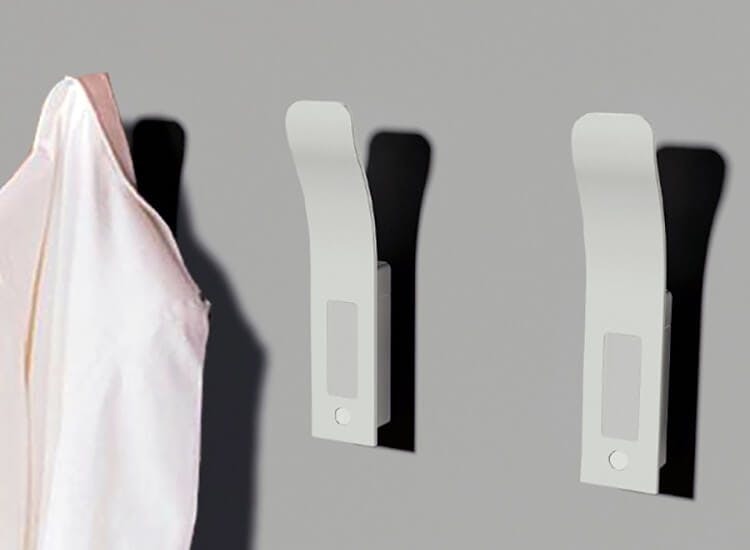 Motion sensor pull hooks with lights are activated in low light while staying off during daylight. Our thermofused melamine is pressed directly onto pinecore substrate. Gloss available. 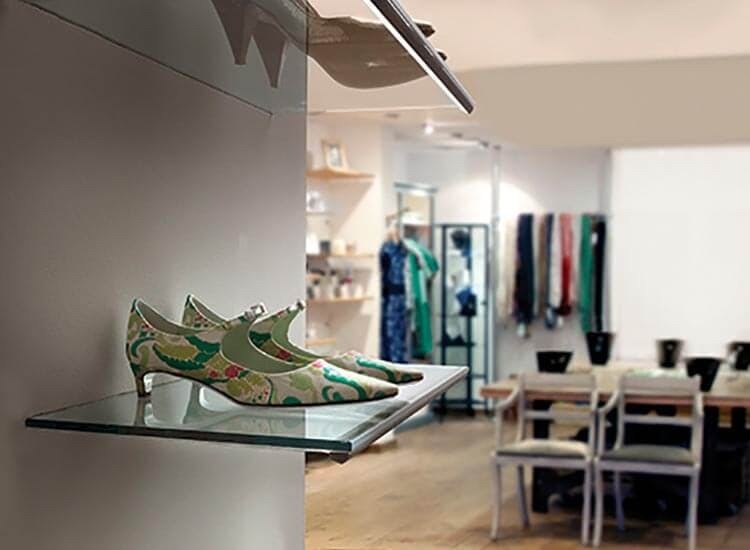 Our thermofused melamine is pressed directly onto pinecore substrate. Matte available. 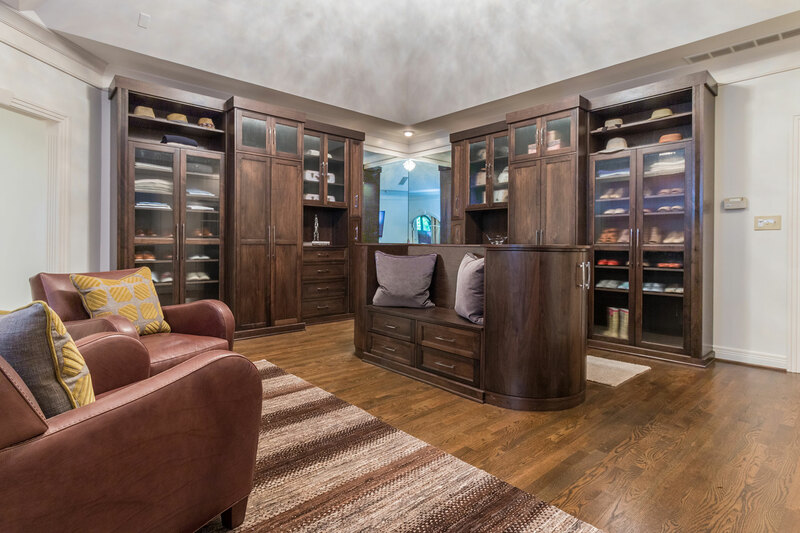 Our wood veneer is made from sustainable forests while the plywood core is made of 100% recycled and recovered wood. Explore material solutions that make your job sizzle. 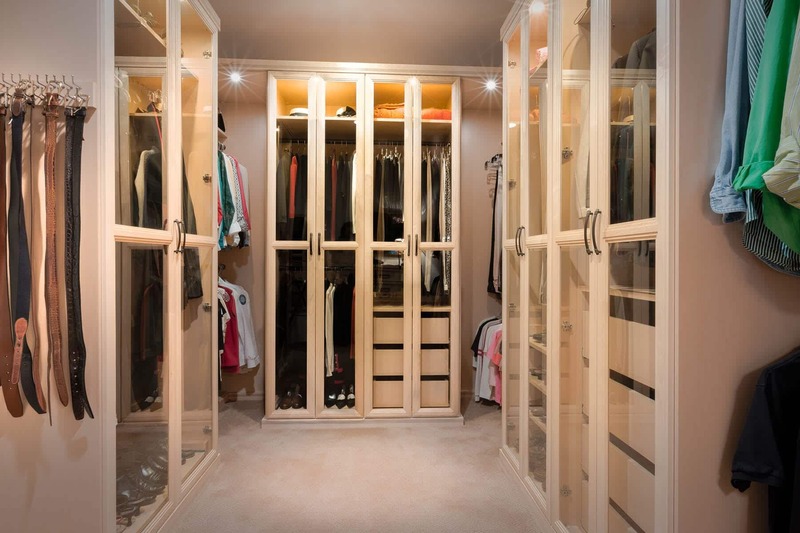 Artisan glass can be used for barn doors, cabinet door inserts, and room dividers. Make a statement with unique or timeless designs. 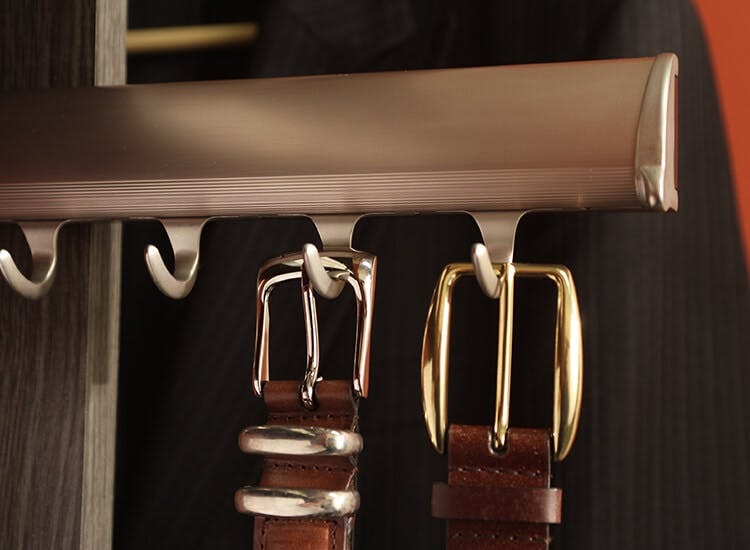 Bring out and enhance key design elements with decorative hardware. 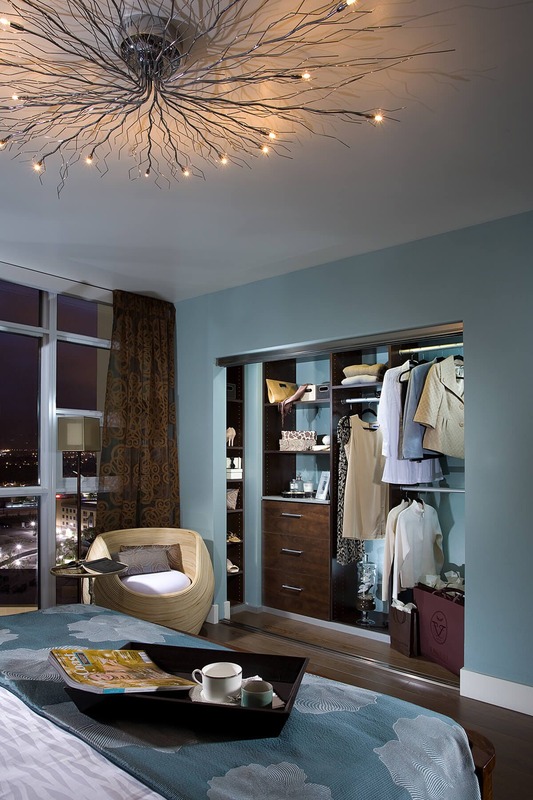 Any space can be enhanced with special lighting from motion sensor lights to task lighting. 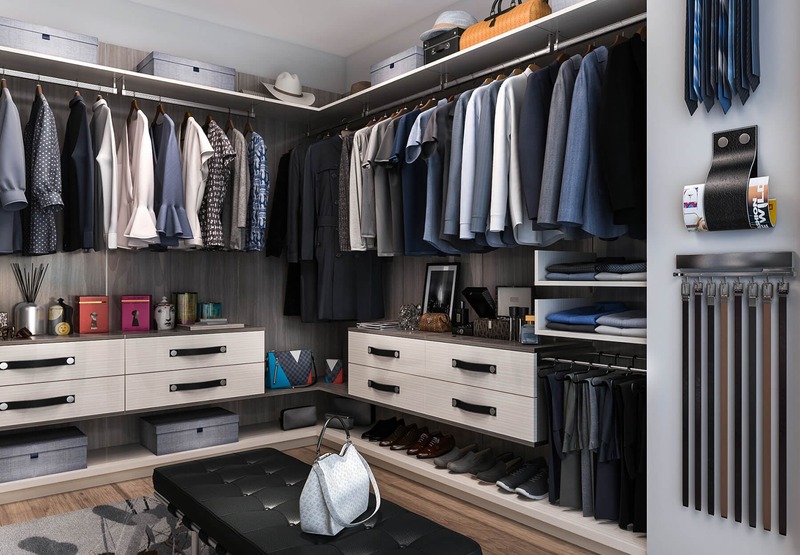 Your designer can show you the entire range of accessories we offer. Enhance the atmosphere of your room with modern corbels in steel and aluminum finishes. Solid wood corbels are offered as decorative accents or for support. 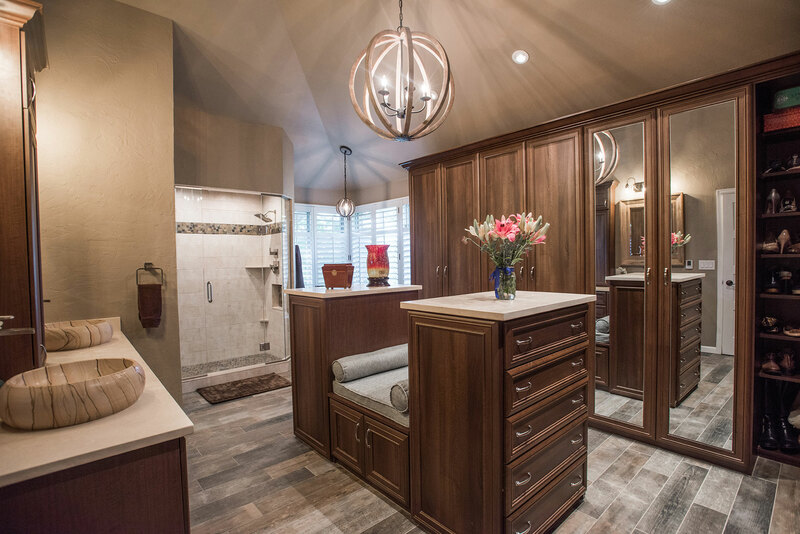 Express yourself with laminate counter tops, backing, and panels. 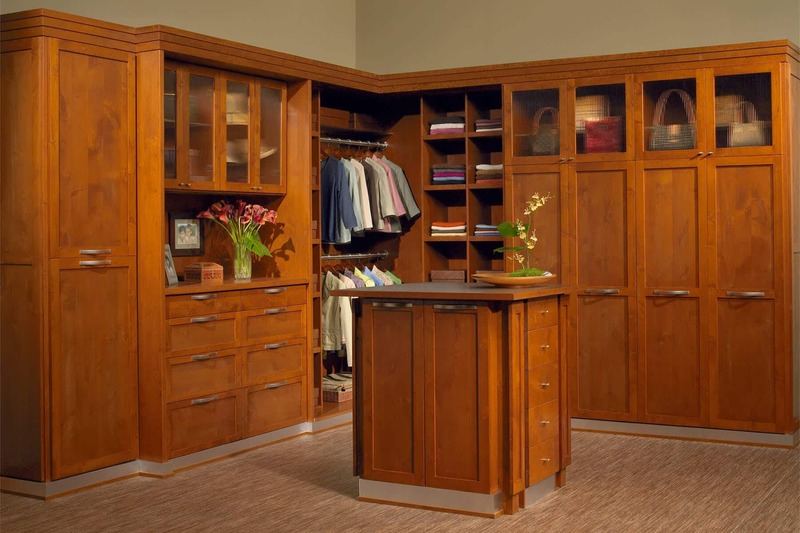 We offer a number of brands and countless patterns to choose from. We offer a complete selection of decorative rosettes that add additional details to the style of your unit. Select from wood and foil specialty door fronts. 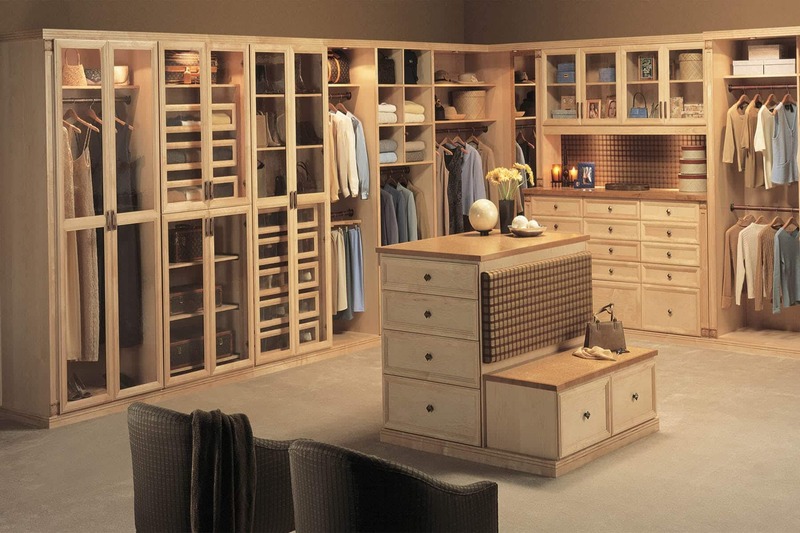 We offer both modern and traditional styles. 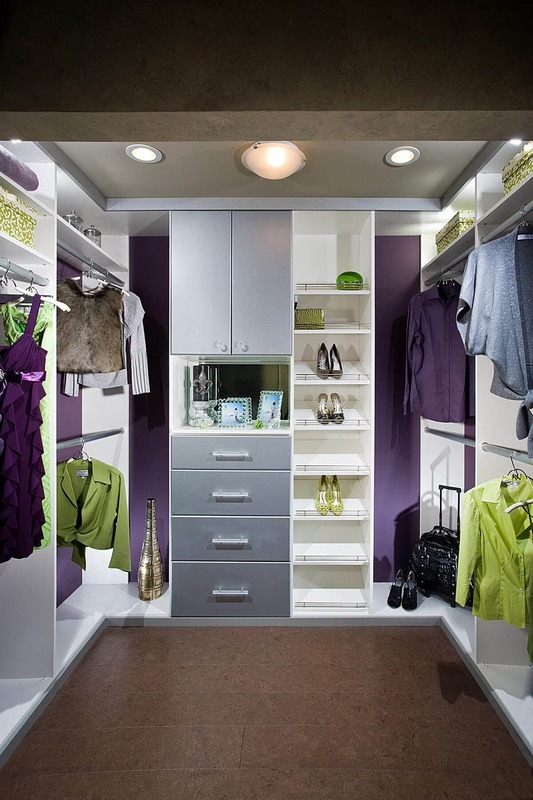 Popular LED lighting can be added to shelves and kick plates. 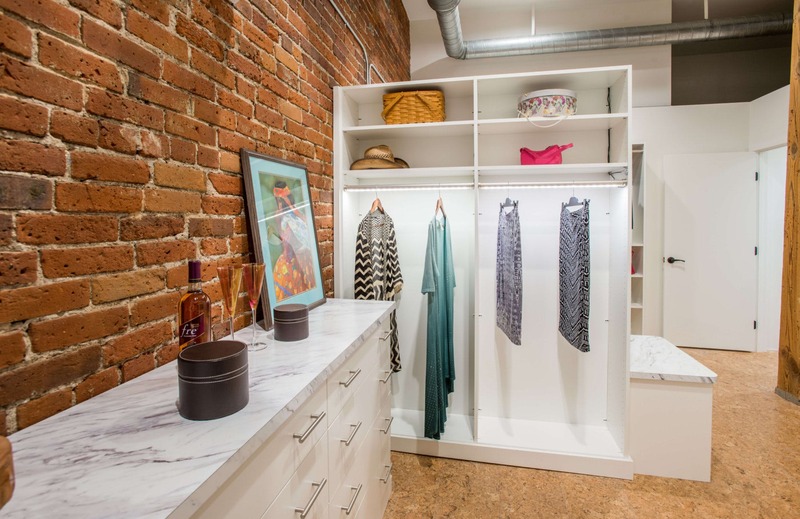 Add decorative storage boxes to shelving and the top of units. Select from Beach or Silver. By signing up, you'll be able to save your Design Board so you can share it with your designer. If you have an existing design board, you can add to it by logging into your account.